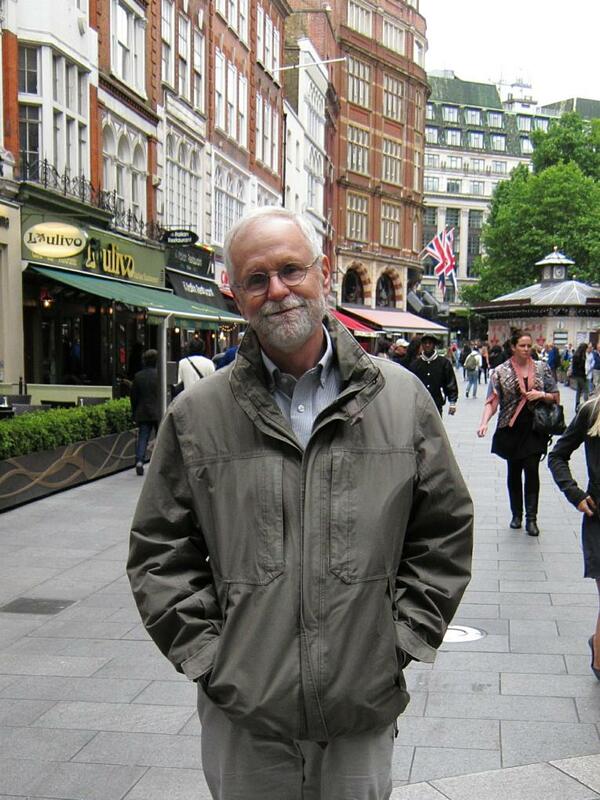 The London trip was quite active — two ten-mile days in a row — so I mostly rested on Thursday. That evening I invited Lisa, Ali and Zhizhong Joël Yao over for an apéro and dinner at L’Hedoniste, which Lisa and Ali had enjoyed with Alexis a few years back, and which we liked again this time. 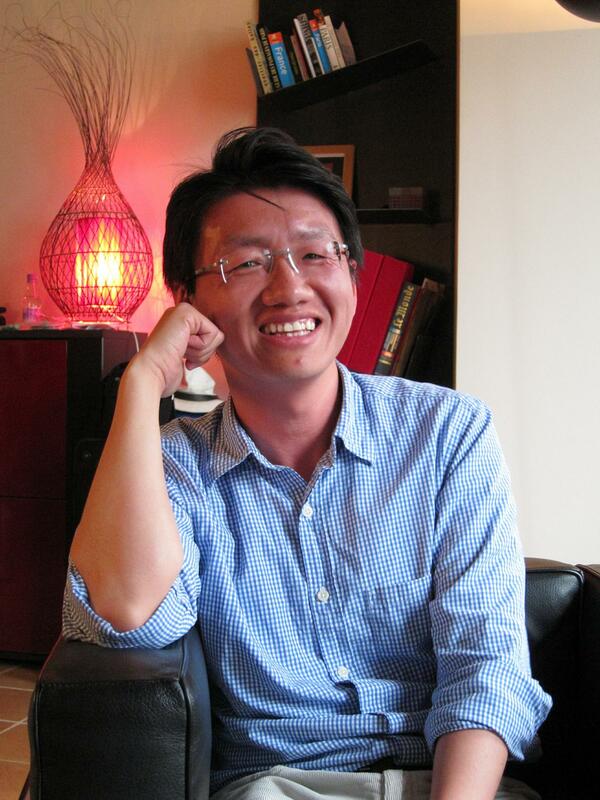 I had been wanting to introduce Lisa and Ali to Zhizhong, since he is still forming a friendship community here and they have several things in common: working in academia, living on rue de Tolbiac, and being very nice. It was a lovely evening, but tinged with the “sweet sorrow” of parting. Ali, Lisa, me and a cousin-to-be-named-later. Photo credit to Zhizhong Joël Yao, whose “rounded forms” motif brilliantly tops my own previous shot in this genre. Zhizhong Joël Yao at 59, rue Saint-Sauveur. Friday morning I set out to finally see the oriental museum, Musée Guimet. The top two floors were closed, however, and I just missed a big Japan exhibition opening July 3. Discouraged, I passed on it once again and grabbed a sandwich for lunch. Looking at my TripAdvisor City Guides app (which I highly recommend) I noticed that the Palais de Tokyo was nearby, and decided to have a look. This is an avant garde contemporary art museum that I had been underwhelmed by on an earlier visit. There was a lot of buzz this time, however, and right off the bat I stumbled on a photo shoot out front. Naturally I joined the fun! Famous model at photo shoot for fashion show at Le Palais de Tokyo. The guys turned out to be models at a jam-packed young men’s fashion show. The hoi polloi weren’t allowed to watch the show — except through a chain link fence! — but another of the models agreed to a snapshot as he was leaving. 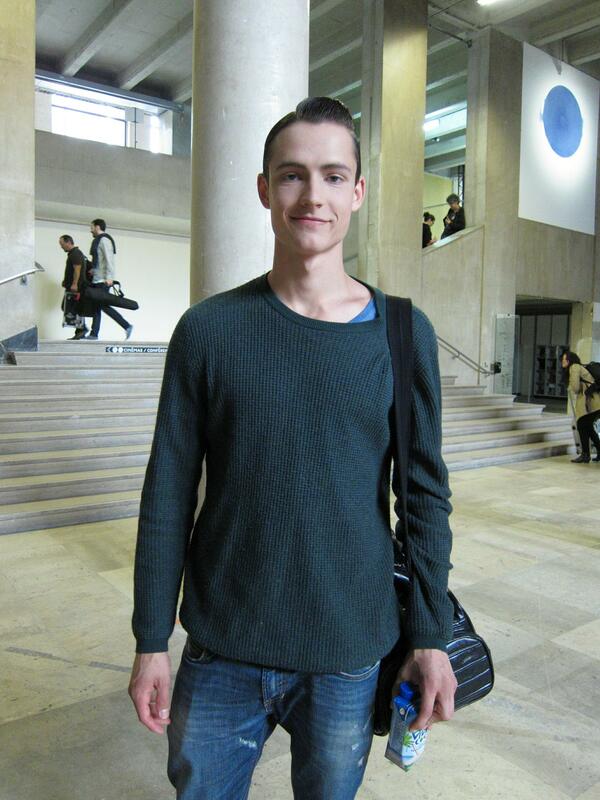 Famous model after fashion show at Le Palais de Tokyo. After I got over being dazzled by all the fashionistas I saw the current exhibition, Nouvelles Vagues. It was an enormous hot mess, its 21 big rooms each being curated by a different young artist. As usual I hated nearly everything, but enjoyed the overall experience, and found a few pieces that gave me a chuckle. 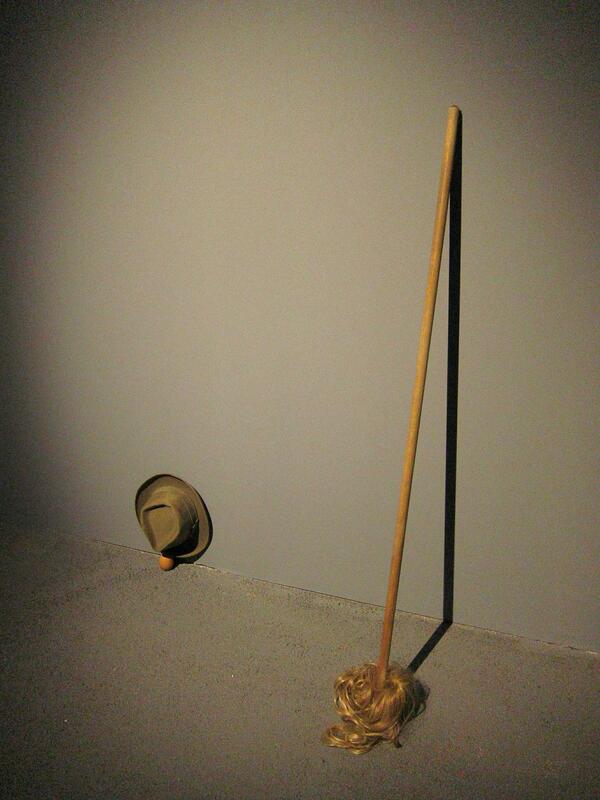 Two surrealist pieces by Martin Soto Climent. 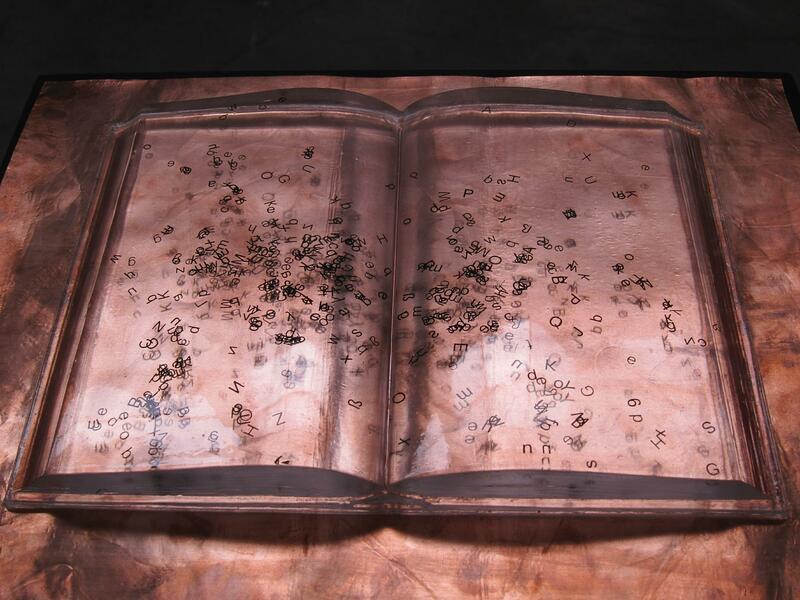 Witty concept piece by Alice Tomaselli. 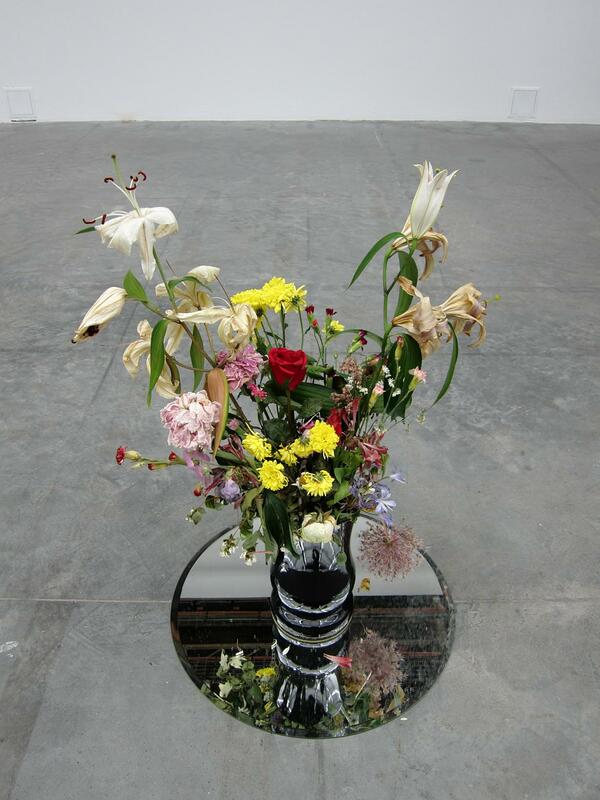 She invited each of the artists in her curated room to contribute a fresh flower for this vase. She then added an artificial rose as her own contribution. The wilting of the other flowers — and eternal freshness of her own — are intended to symbolize the transiency of the other artists and her own enduring fame. After the museum I strolled down to the Pont d’Alma, and recalled something about newly-opened improvements to the nearby quais. 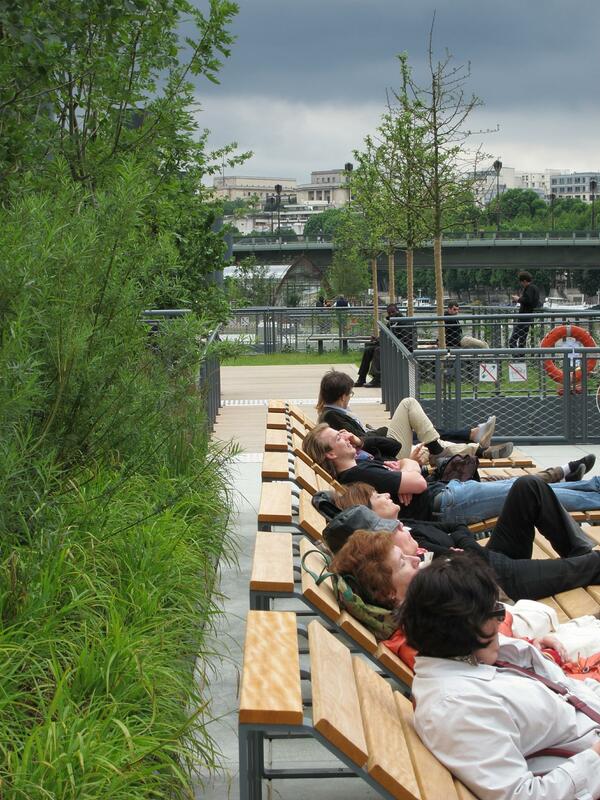 These turned out to be a series of floating gardens that resemble New York’s High Line and Paris’s own Promenade plantée. The gentle rocking of the floats added a pleasing touch when I stretched out on one of the lounges for a bit. 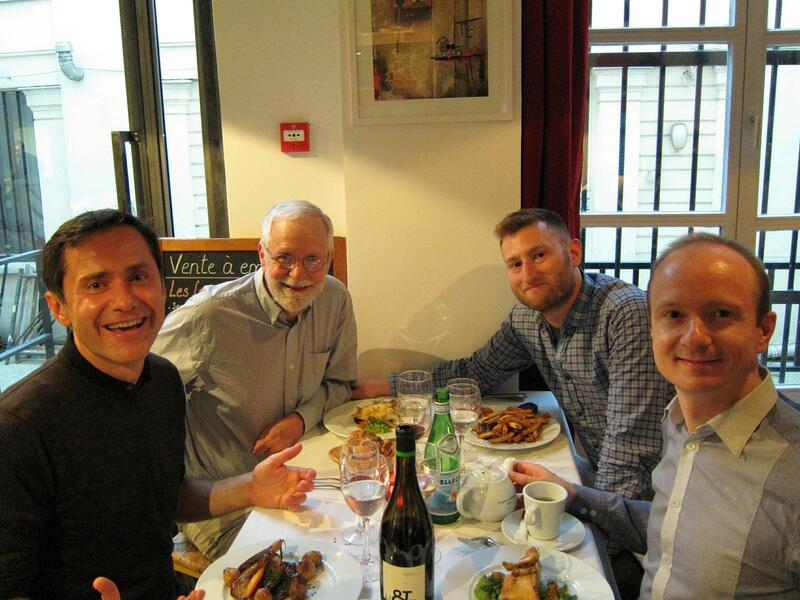 This evening’s farewell dinner was with Colin and Jamie Blasina, with whom I had enjoyed an afternoon at Rosa Bonheur at the very start of this year’s petit séjour. 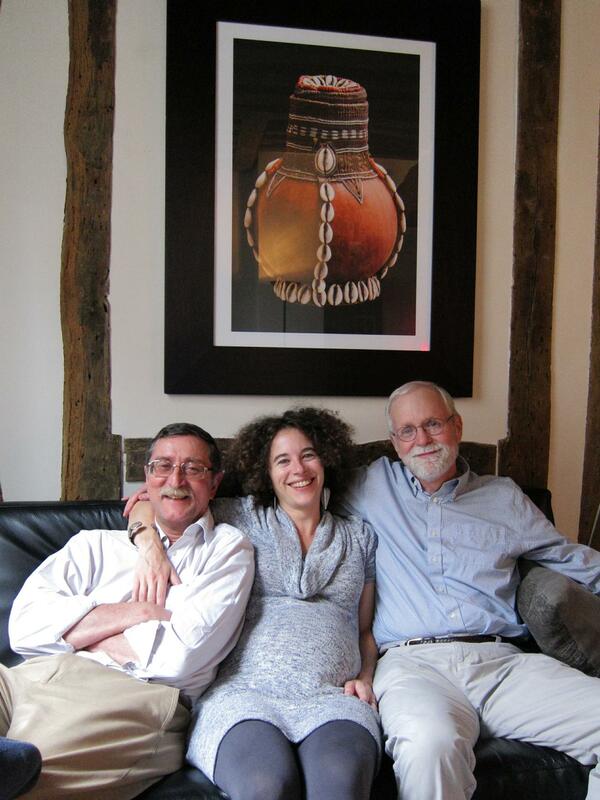 They are both leaving Paris shortly as well, but they will be back in Cambridge, as housemates of my book-group friend John O’Connor, in the fall. Jamie chuckling as street urchins steal the helium balloon attached to his chair. 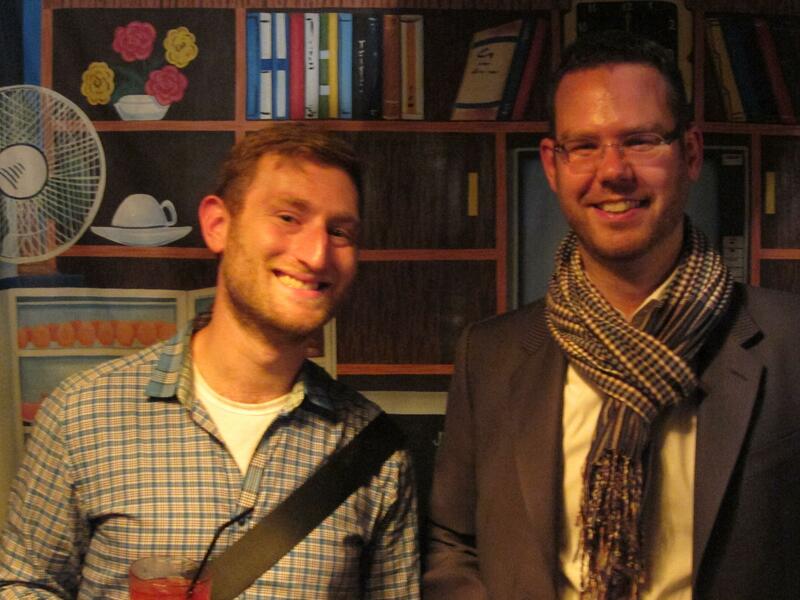 Jamie and Colin at our 2013 farewell dinner, at Lézard Café. I had hoped to be able to watch the Paris gay pride parade the following afternoon, but cleaning my apartment — comme d’habitude — took forever and I had to cancel. 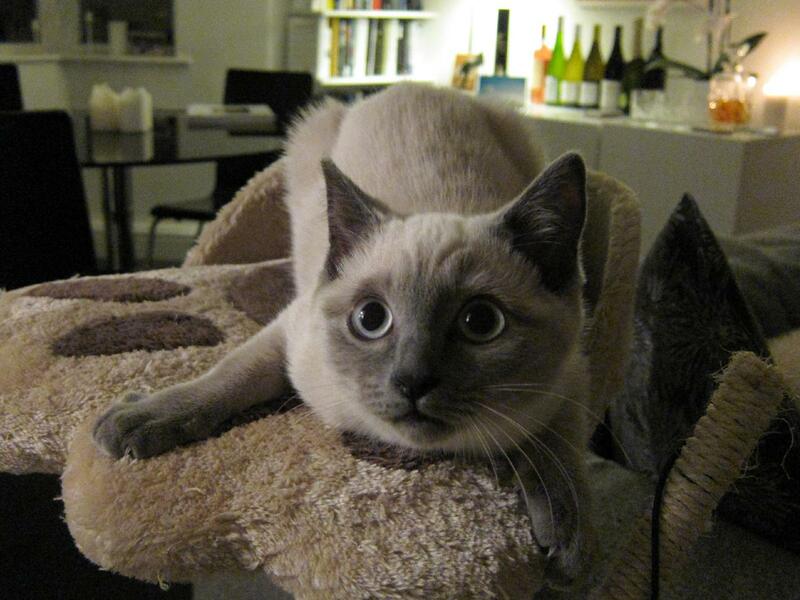 As I was scrubbing and mopping I did wonder, however, why I clean my Paris apartments so obsessively. Initially the habit may have come from anxiety about being charged a cleaning fee, and I have heard horror stories about landlords that complain about every water spot in the shower. But my cleaning goes way beyond what could reasonably be expected — taking most of a day. And in this particular place they always bring in a cleaning lady anyway, who after my efforts must feel frustrated (actually delighted) by her inability to find anything to clean. To add to the absurdity, the owners of this place like and trust me so well that they don’t even look around. Another year perhaps I’ll try to ease up a bit! Zhizhong Joël Yao had planned to stop by on my final evening to leave me a gift for my Boston roommate Vikram, and to pick up some Paris guidebooks that Colin had returned. He surprised me with a lovely little music box, playing La Mer, that he had bought for me in a boutique at Palais Royal. 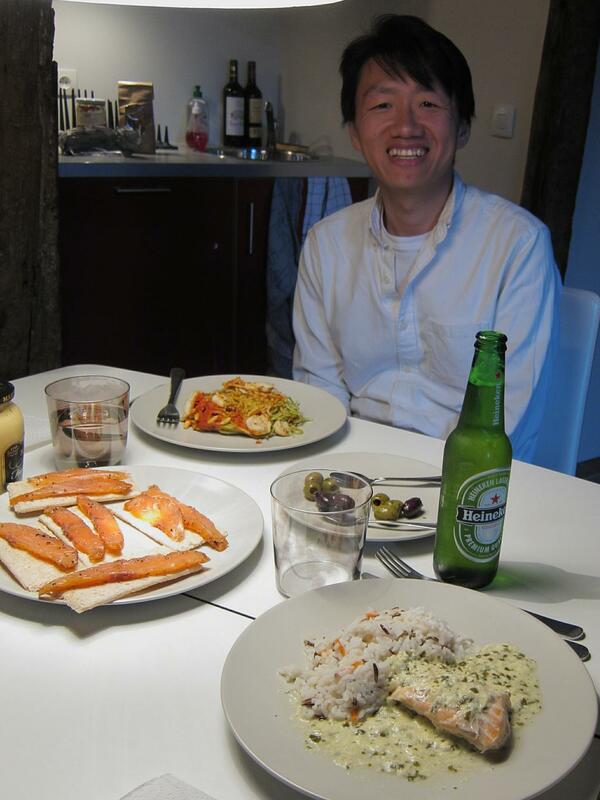 We looked around the quartier for a nice and really affordable restaurant but eventually decided to make a meal from two frozen dinners I still had, along with smoked salmon, olives and a few other random items. It was a (previously frozen) feast! For dessert we shared a puit d’amour (Well of Love — props to Geoff for calling attention to it) from Stohrer, the famous traiteur just a block or two down rue Montorgueil. 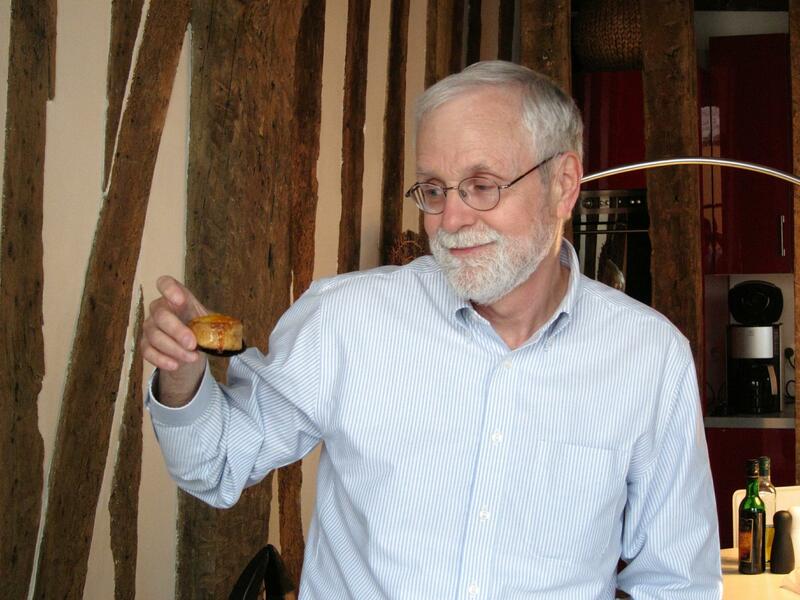 Bob admiring his puit d’amour from Stohrer. These last few days have reminded me of the final week of last year’s visit: “The days are getting cooler, and the evenings downright cold: time to move on.” But wait, that was September and this is June! My first week this year was lovely — albeit cool — but the rest of the month has been on-and-off rainy and cloudy, and quite chilly for June. I’ve had lovely days, and taken good advantage of them, but the weather overall has been only so-so. The winter and spring in Paris were truly terrible, though, so I can’t complain. Leaving to catch my flight home in half an hour! Au revoir, Paris ! Mot du jour: « rebeu ». This is a slang term for French residents of North African ancestry, with a particularly interesting etymology. Since the 16th century there has been an argot of French called le verlan in which two syllables of a word are reversed. The term « verlan » itself derives from reversing the phrase « à l’inverse ». In the 1980’s the term « beur » started being used for North Africans in France. This was a verlan transformation of “Arab,” reversing the “r” and the “b.” More recently, the term « rebeu » arose, especially among young beurs, as a further verlan transformation, again reversing “b” and “r”. Props to Zhizhong Joël Yao for being the first to explain verlan. Our Pig Latin has a slight resemblance to verlan, but verlan generates new slang words rather than applying a simple transformation to any word. 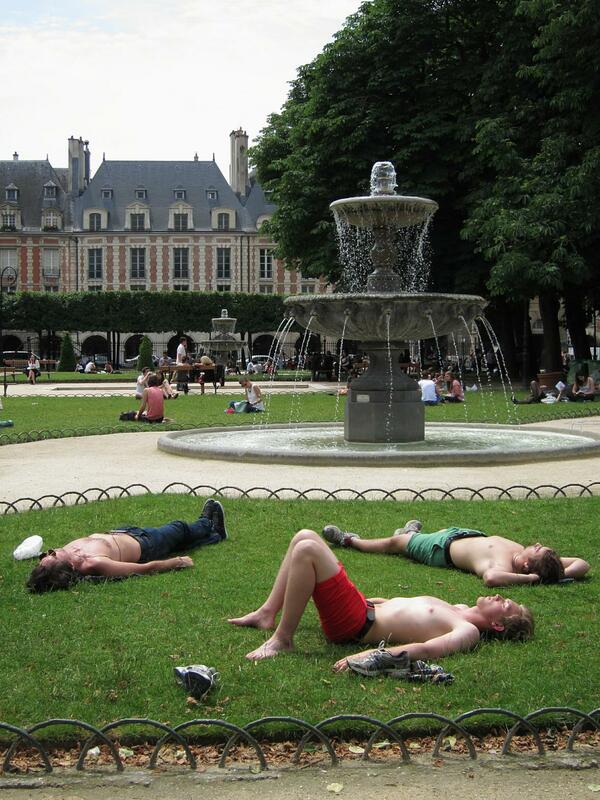 June in Paris has been so exhausting that I needed a break! Three days in London seemed like the perfect get-away. Not really, of course. 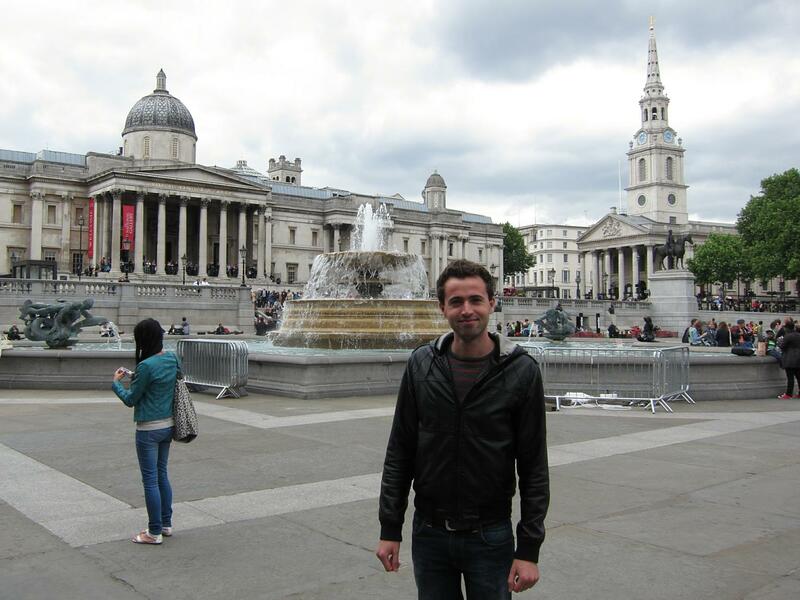 My London vacation-within-a-vacation was more about friends and sightseeing than relaxing. 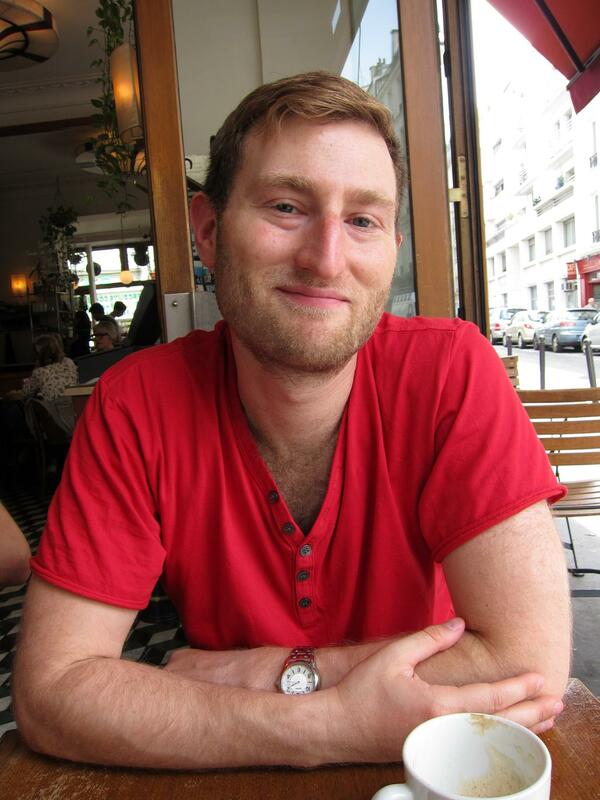 I had met Michael Åhs several years ago, when he was a grad student, through the Harvard Humanist Discussion Group. He visited me in Paris for long weekends each of my first two years here, when he proved to be a curious and intrepid flâneur. 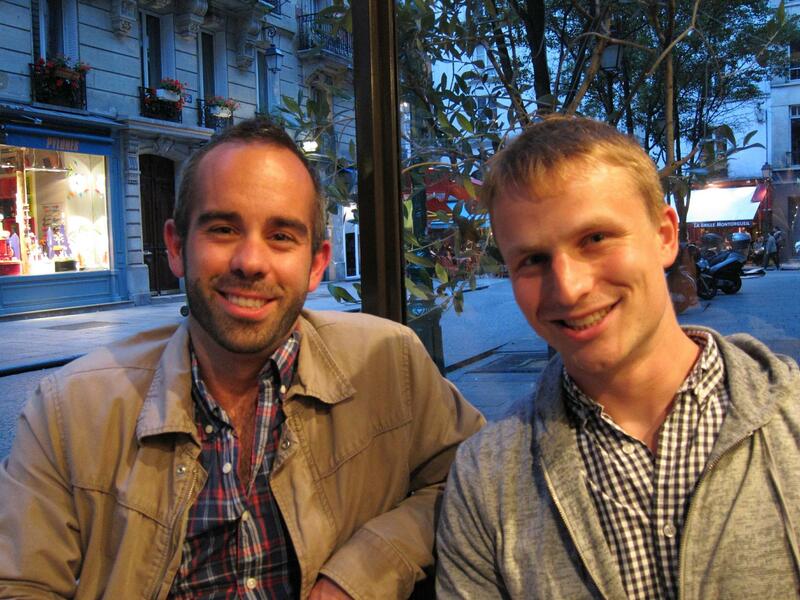 On his first Paris trip Michael introduced me to Dan and Rick, a gay couple with a place in London, with whom I have also became friends. This year, Michael already had plans to stay with them for a few days towards the end of June, so we arranged for me to visit also for the first two nights of his stay. I don’t think Michael has many other gay friends, but he’s so secure in his own heterosexual identity that the orientation of friends is a non-issue. I had been excited by the idea of a tunnel under the English Channel since I was a little kid, when it seemed like a distant dream, so it was a thrill to take my first trip through the Chunnel, on the Eurostar high-speed train. I have to admit, however, that apart from speed this was really just a reasonably comfortable train trip. As a French acquaintance pointed out, you can’t see anything while you go under the Channel. What did she expect: Sharks? Nuclear subs? Apart from changing planes I had not spent time in London since a family trip in the ’70s, so I could make no pretense of being anything other than a slack-jawed tourist. Michael didn’t arrive until Monday evening so Dan took the day off to show me around town. 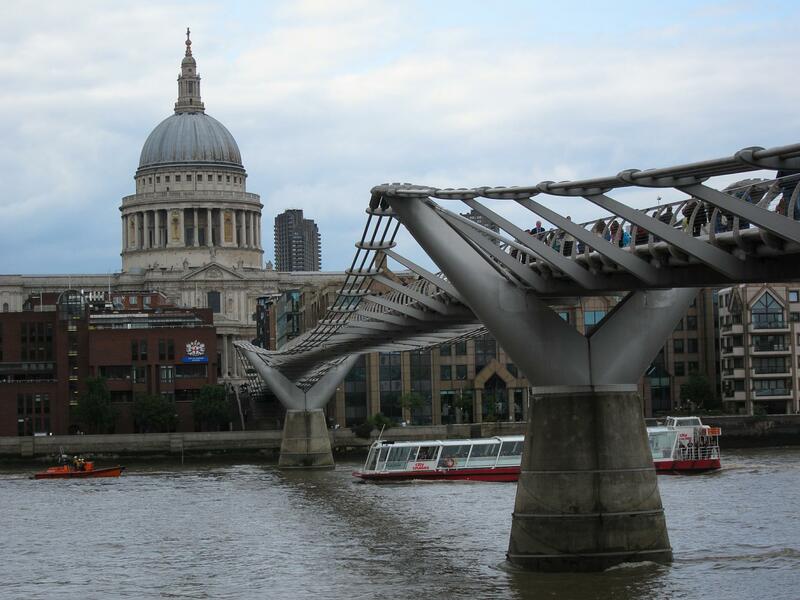 St. Paul’s and Millennium Bridge. 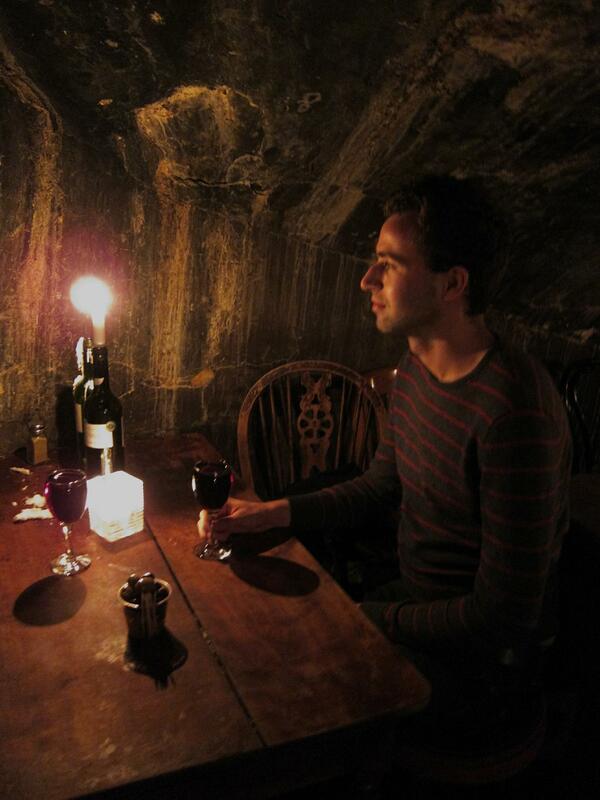 The squares and buildings were of course impressive, but the single most memorable experience of the day was a glass of wine at Gordon’s Wine Bar, in a cellar lit only by candles. Dan at Gordon’s Wine Bar. That evening Dan made a home-cooked meal for Rick, Michael and me. It looked as good as it tasted but you’ll have to take my word since I was too much in the moment to remember my camera. Michael and I got an early start the next morning and set out to explore London on our own, while Dan and Rick worked. A fanciful building I liked near the Houses of Parliament. 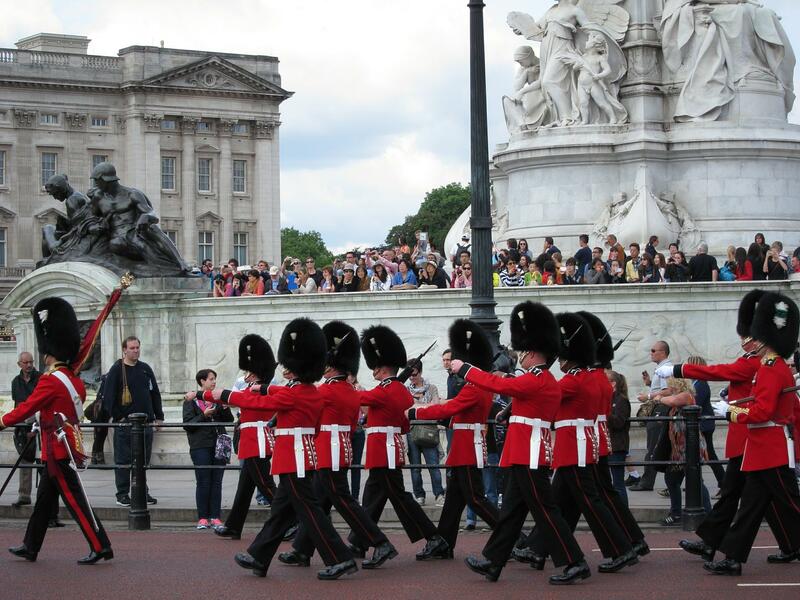 We just happened to arrive at Buckingham Palace for the Changing of the Guard. Honest! One excellent feature of London is that nearly all of the museums are free. This not only saves money but it eliminates the psychological effect of the “sunk costs fallacy” — i.e. “I paid $15 to get into this place so I have to see everything.” Dan and I saw one exhibition at the Tate Modern and a few choice rooms at the National Portrait Gallery, then in each case continued on our walk when we were ready to move on. Michael and I did the same thing the next two days, at both the Victoria & Albert Museum and the British Museum. Our only miscalculation was arriving at Tate Britain well before it opened. That evening the four of us set off for dinner at a nearby Indian restaurant. We happened to run into two gay friends of Rick and Dan — Simon and David — so naturally we invited them to join us. 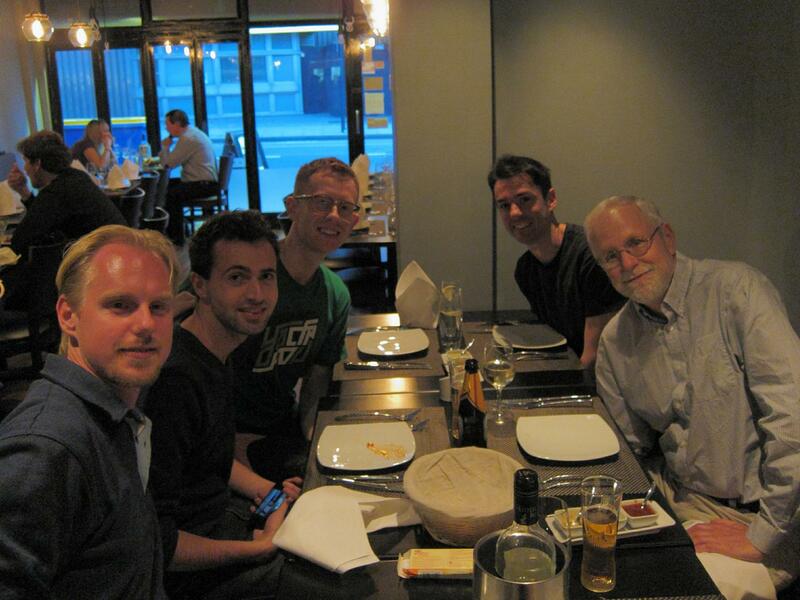 Michael, Dan, Dave, Simon and Bob. With Rick taking the photo. Fluffy was unable to join us for dinner, but she was a full participant in a mini birthday celebration afterwards. My train back to Paris wasn’t until 7 pm on Wednesday, so Michael and I had time for another city walk. 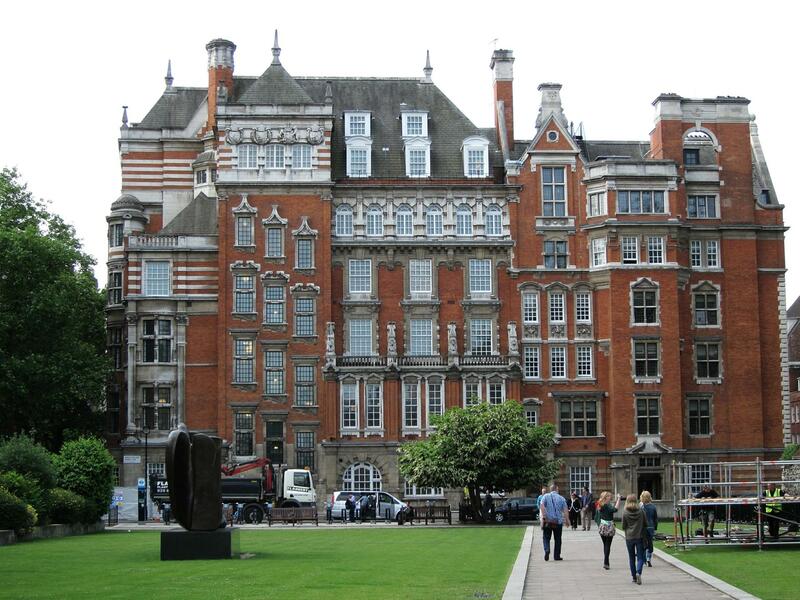 We started in Bloomsbury at Russell Square, which I remembered fondly from our family trip decades before. We spent most of the day, however, at the British Museum. I had seen photos of the Great Court by Norman Foster, but I was blown away by it in person. 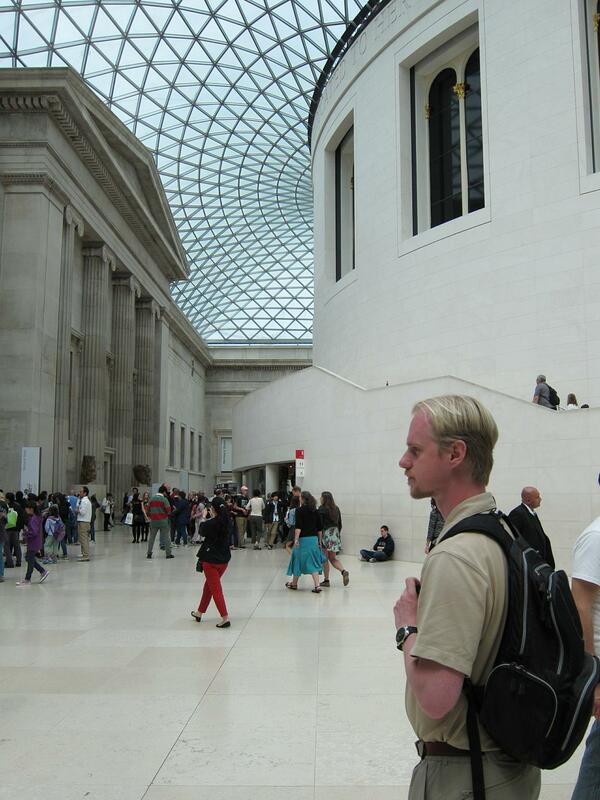 The Great Court of the British Museum, with the Reading Room (and Michael) on the right. 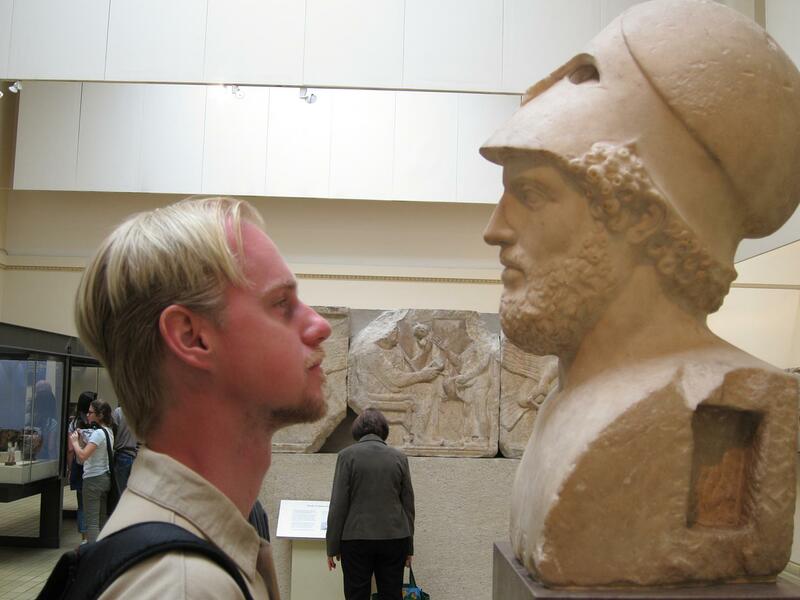 Michael and Pericles compare beards. That afternoon we just had time for a beer with Dan before I headed out to catch the train back to Paris. At each end the station was just a few stops on the subway — a huge convenience over air travel. I’ve posted two photo sets on Google+ for those who want to see more: 2013 London People and 2013 London Places and Things. This time of year is always bittersweet: the days are wonderfully long, yet they also start getting shorter. That feeling is doubly so for me, since I am beginning the last week of my petit séjour, and already planning my farewells. Jared and I slept in on Saturday morning; this year my days have mostly started around 10 and ended around 2, which is about four hours later than in Boston. After a late breakfast we met up with Geoff for coffee in the Marais. He went ahead and had lunch before we arrived since we weren’t hungry yet. After yet another good conversation Jared and I followed his suggestion and had lunch at Des Gars dans la Cuisine (the guys in the kitchen) on rue Veille du Temple. The lunch formule was a good value at 14 euros but the a la carte prices were twice that for a plat alone so I wouldn’t recommend the place for dinner. 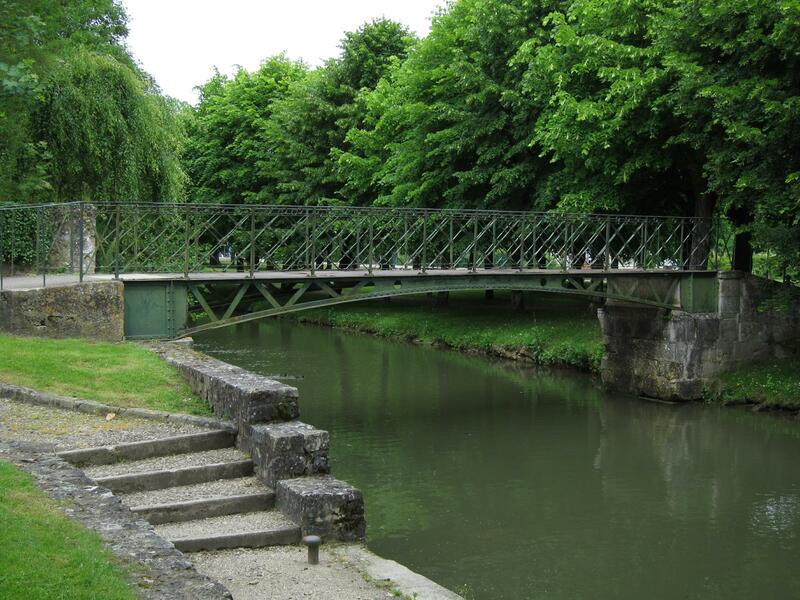 We continued up to the Haut Marais. 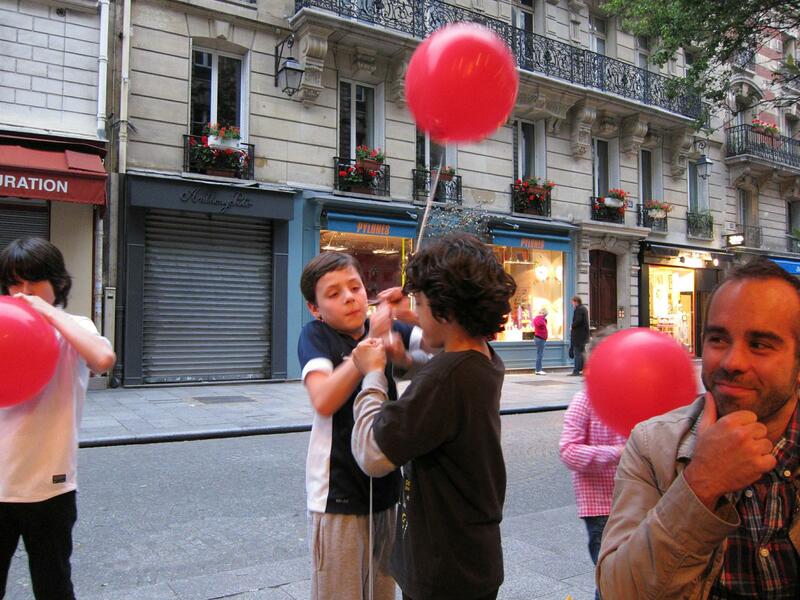 Jared especially liked Le Marché des enfants rouges. I could see renting on one of the quiet streets in this area another year; not too close, however, to the somewhat sketchy place de la République. That evening we met Darko and Mathias for dinner at Chameleon, not far, as luck would have it, from where Jared and I had been walking that afternoon. The service was warm and friendly, the ambiance was pleasant, and the food and wine were good and reasonably priced. I would recommend this restaurant. After dinner we had a drink at Bonne Nouvelle, the bar that Geoff had introduced us to a few nights before. Once again I was impressed by the warm welcome I got from the barman. Mathias pronounced the place marrant, which I think was a compliment (but I’m not sure). 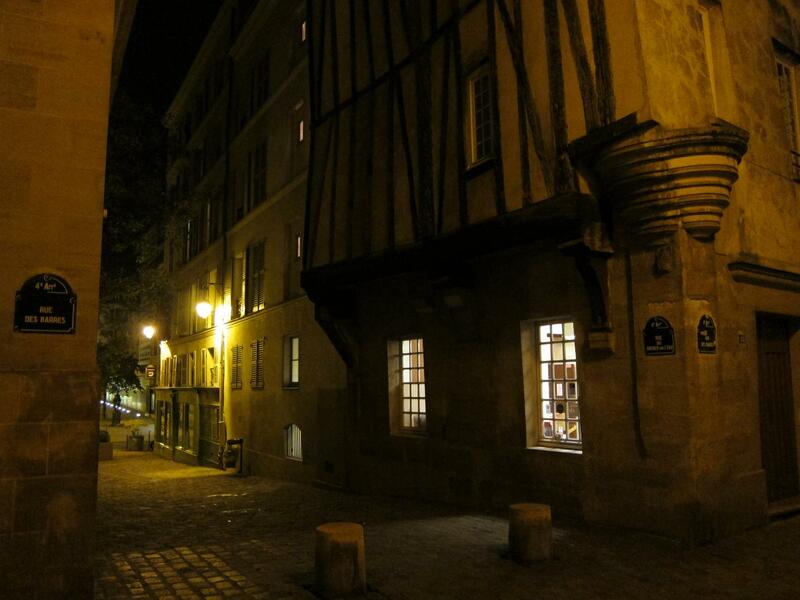 After finishing our drinks he and I went home, while Jared and Darko headed down to the Marais for le clubbing. The next morning Jared had only about an hour for breakfast and packing, then he was off to the airport. The weather was cloudy with persistent rain showers so I spent most of the day inside, blogging, doing laundry and reading. A record low on my fitbit! The weather and Lisa’s visit to a bereaved colleague derailed our plan to take an afternoon walk, but late afternoon coffee at LB gave us the opportunity for a tête à tête. 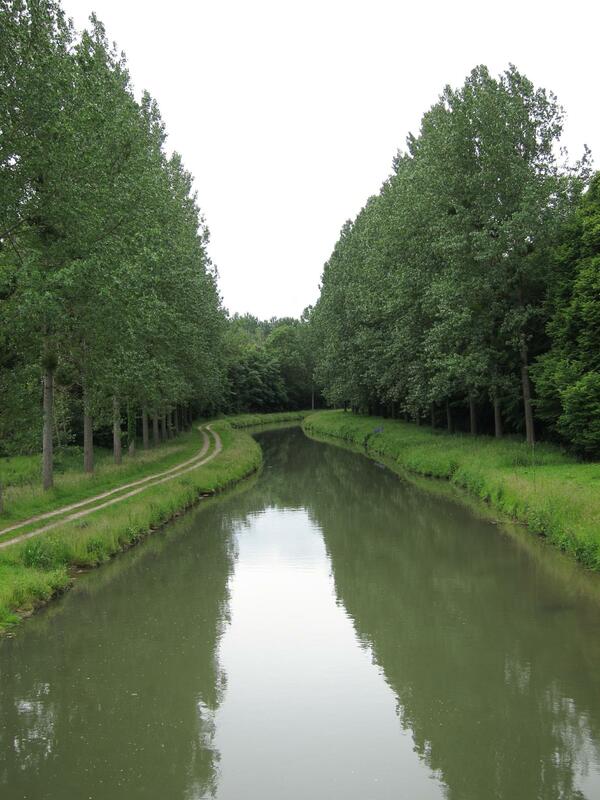 Off tomorrow by Eurostar for two nights in London. Mot du jour: « marrant ». “Funny”, but can also mean “comic” or even “bizarre”. Friday was June 21, the date each year of La Fête de la musique (the Festival of Music). I had stumbled across it two years ago and been simply blown away. Hundreds of free musical performances, in all genres, take place simultaneously across the city. Central Paris (at least) is thronged with happy people, many of them young and attractive (and drunk). My 2011 blog post, including links to several video clips, is at this link. I was interested to learn that the event is intended to be world-wide; the closest thing we have is New Year’s Eve, but the summer solstice is more conducive to outdoor fun. 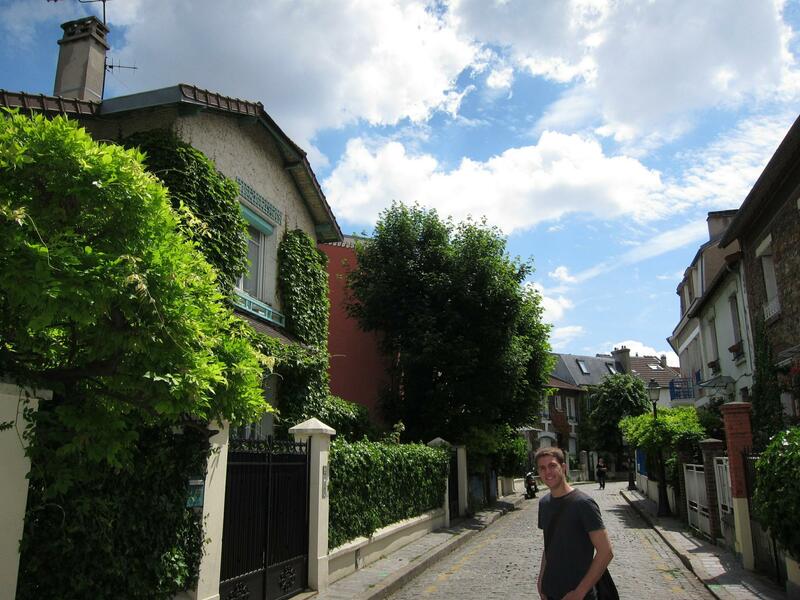 Jared and I started the day with another walk across the 5ème, which he remembered fondly from his student days. 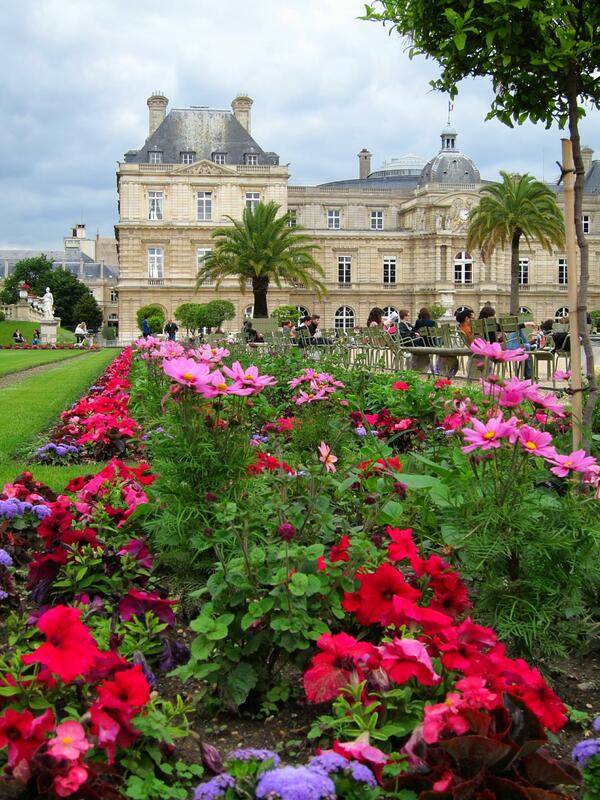 It was cloudy, but the flowers in the Jardin du Luxembourg were still pretty. Jared raised a question that I hadn’t previously focused on: How do those palm trees survive the winter? On closer examination we confirmed that each was in a large pot, so they could be moved into an Orangerie (a large greenhouse) during the winter months. We had lunch at a nearby brasserie: two quite acceptable salades Niçoise. We had another Vélib’ issue after lunch, even though there were lots of bikes: I got one right away with my annual card but the terminal (borne) at the nearby station was frozen. The next closest station was a considerable walk, but there we both got bikes. I headed home and Jared went shopping. 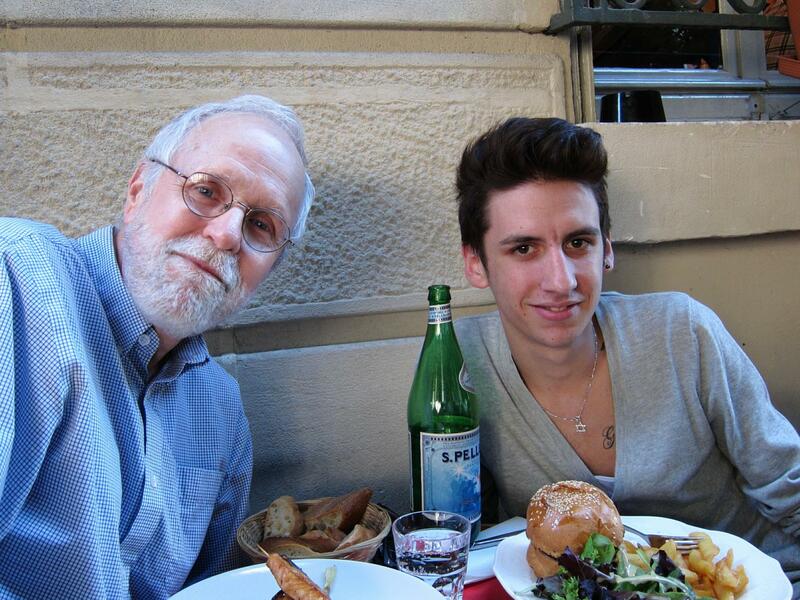 I had been chatting on line for a few days with a young Parisian man named Hugues (pronounced, roughly, “Oog”). 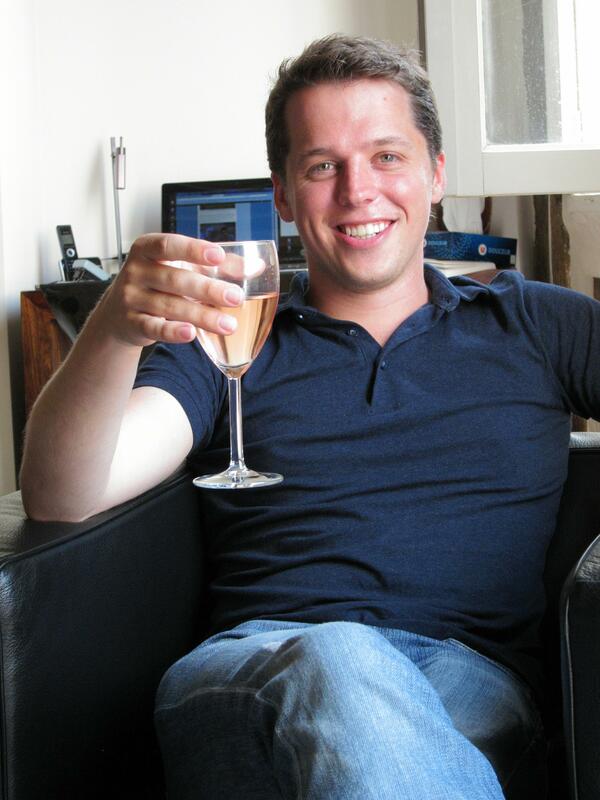 It suddenly developed that he had time for an apéro that very afternoon. We met at the LB, which I like because you can people watch on both rue Montorgueil and rue Tiquetonne. 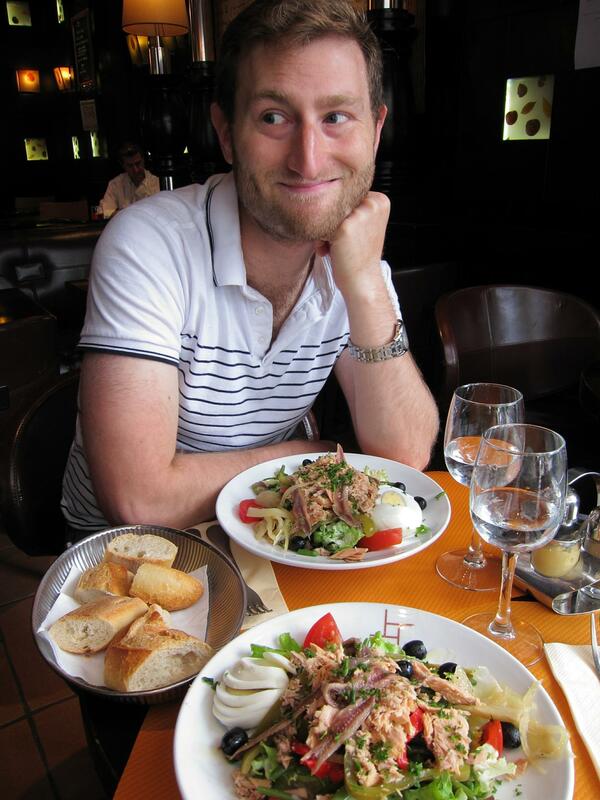 Jared and I had made previous plans to cook dinner together that evening, and on a whim I invited Hugues to join us. The three of us had a lovely time cooking and eating a fish dinner made with fresh ingredients Jared had just bought along rue Montorgueil. 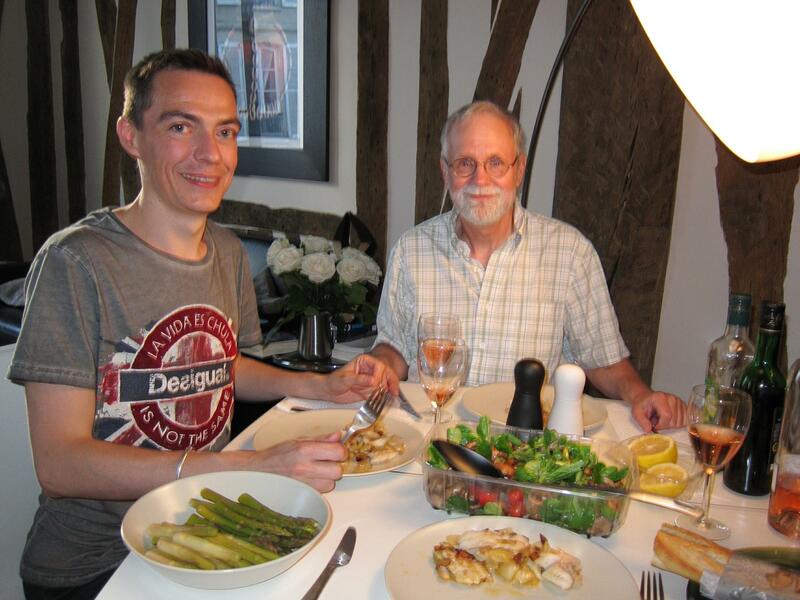 Hugues and Bob at our home-cooked dinner, with Jared, at 59, rue Saint-Sauveur, on June 21, 2013. After dinner the three of us met up with Geoff, who introduced us to yet another cozy and friendly gay bar, Les Souffleurs. My first year in Paris I lived for a month just a couple of blocks away, on the same street, but I never realized that this place was there. I don’t much enjoy the big noisy style of bar, but I found this place sympa. I’ll definitely be back! 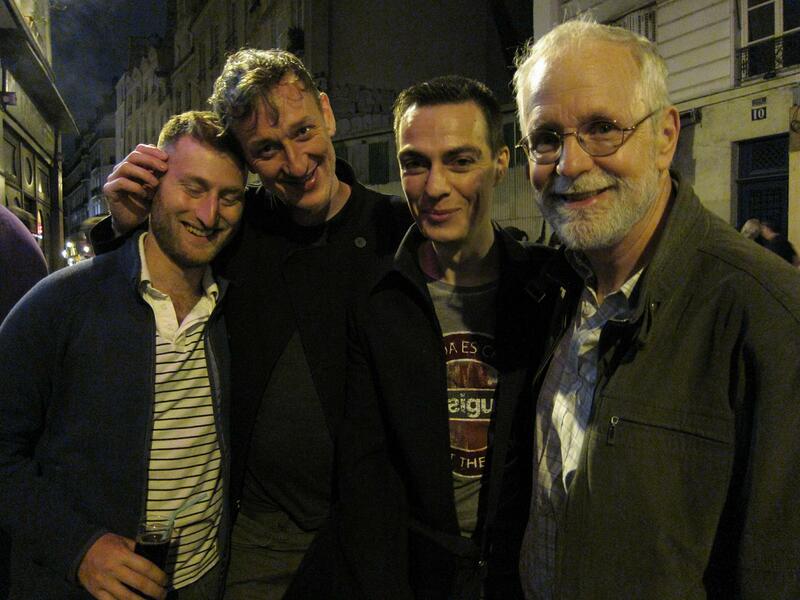 Jared, Geoff, Hugues and Bob at La Fête de la musique. 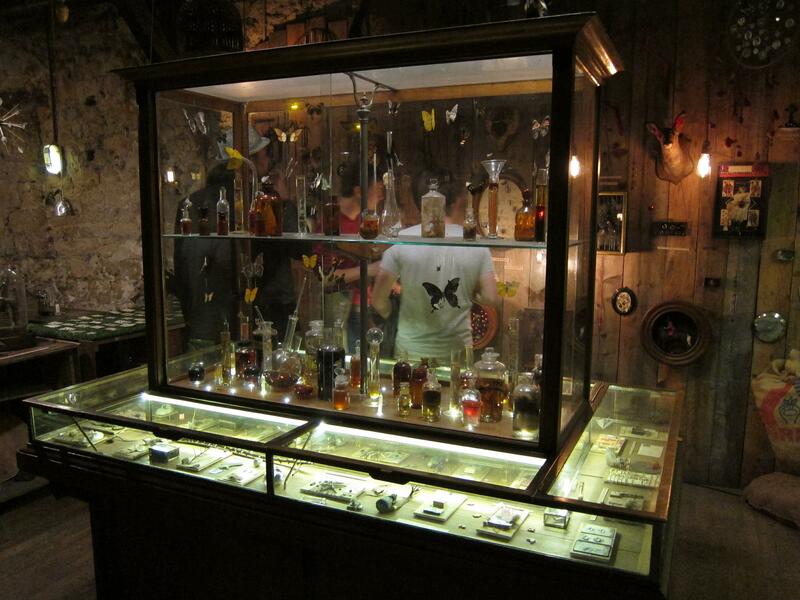 We bar-hopped to Le Labo, a modern bar a few blocks away where Hugues had installed the lighting and video screens. The technology was impressive but the crowd was sparse and I see no reason to go back. At the end of the evening Geoff headed home and Hugues walked Jared and me back to 59, rue Saint-Sauveur. On any other night the métro would already have stopped, but it runs all night on La Fête de la musique. Hugues is not fluent in English so our on-line chat and nearly all of the evening’s conversation was carried on in French. Geoff is fluent in French, while Jared and I are both pas mal, so the language barrier wasn’t an issue. There were even a few amusing times when Jared and Geoff lapsed into English and I translated for Hugues. Mot du jour: « rencard ». Slang for a rendezvous, but I prefer the definition in Google Translate: “hot date”. Wednesday was a recovery day. I spent the morning catching up on my blog and curating photos from the previous week. In the afternoon I finally got the haircut I have been wanting, at the place Alexis recommended on rue Saint Denis. It was 25 euros, which is more than twice what I usually pay in Boston, but it included a relaxing shampoo and lots of TLC so I didn’t begrudge it. The lowest price Alex and I spotted last week was 8 euros in a poor neighborhood, but I’m guessing that you would get what you paid for. With a touch of melancholy I made what will probably be my last big shopping trip of the year (just cross the street), including bottles of rosé and bubbly and Bordeaux that I hope will be put to good use. Jared spent his afternoon at the Dynamo! exhibition that I recommended highly, after sorting out a slight confusion between the Palais-Royal and the Grand Palais. So many palaces! He loved the exhibition also, though the piece he liked best — a fog-filled immersion room — had been on the fritz when I visited. At 7 pm I met up with my elementary school classmate Alan Walworth and his teenage daughter, Carolyn. 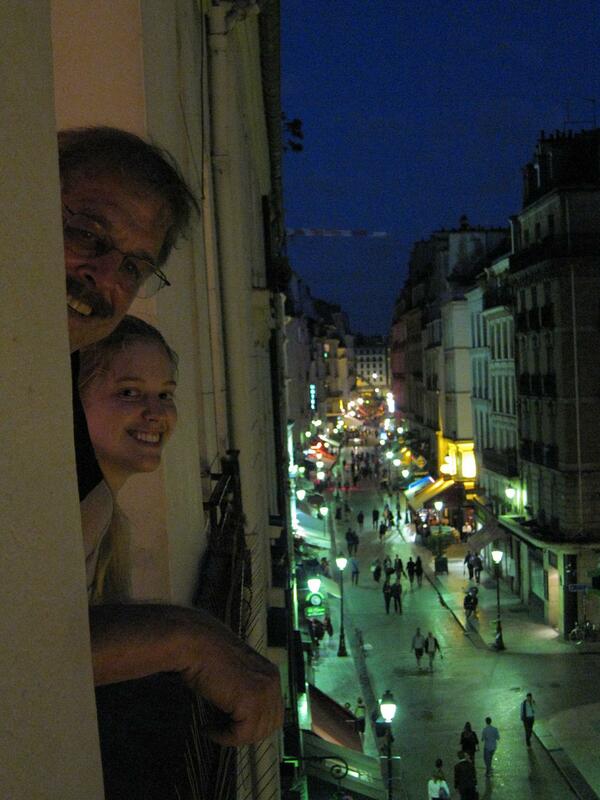 This was their last night in Paris at the end of two weeks of traveling around France. I gave my usual tour of the quartier, spiced with fascinating (to me) historical nuggets, but Carolyn was just about at the end of her teenage rope with France, her dad, and his quirky old friend. Her mood improved markedly, however, after a nice dinner at Bianco. We wrapped up the evening with a look out my rue Montorgueil windows, a glimpse of the Oasis d’Aboukir, and a bracing walk down to Châtelet to get them safely onto the 14. My one piece of advice for Carolyn was to pay attention: to her perceptions and how she feels about them. 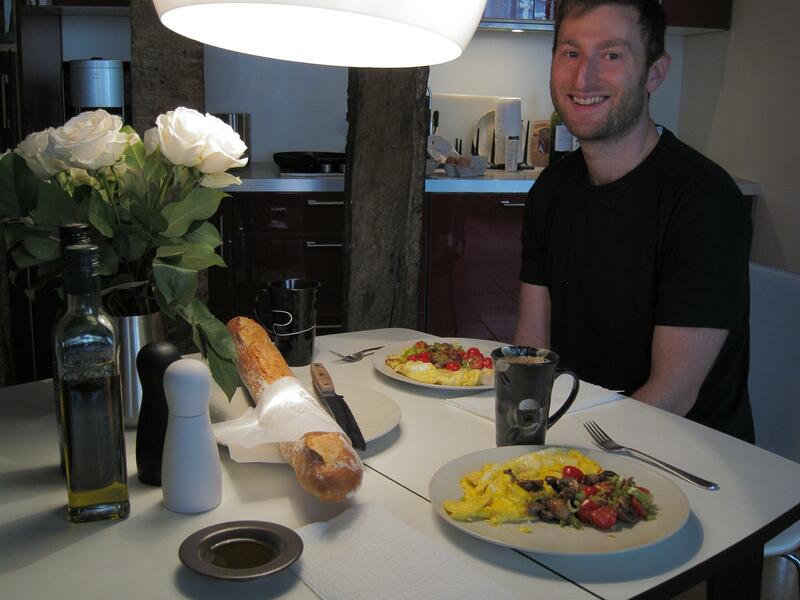 We got a late start on Thursday morning, but once we got underway Jared surprised me by whipping up a couple of delicious omelets, made with leeks and tasty coeurs de pigeon. Thursday’s weather was cloudy with the ever-present possibility of rain. I have learned that in Paris “20% chance of rain” doesn’t mean 80% chance that it won’t rain; it means that it will rain about 20% of the time, and may be lovely the rest of the day. Jared needed to spend the morning finishing up a math paper so I set off to explore the 5e, starting at the southerly edge. Rue Mouffetard is indeed charming — and has more than a passing resemblance to rue Montorgueil — but I now find the former too touristy. Quite possibly rue Montorgueil will go the same route, but for the moment it still feels more French. At the top of the pedestrianized section I grabbed a Vélib’ and zipped over to the neighborhood of the Panthéon. I am conscious of the risk of riding without a helmet, and I try to stay on quiet streets or in bike lanes, but the thrill of being able to cycle somewhere whenever you want it is too tempting. 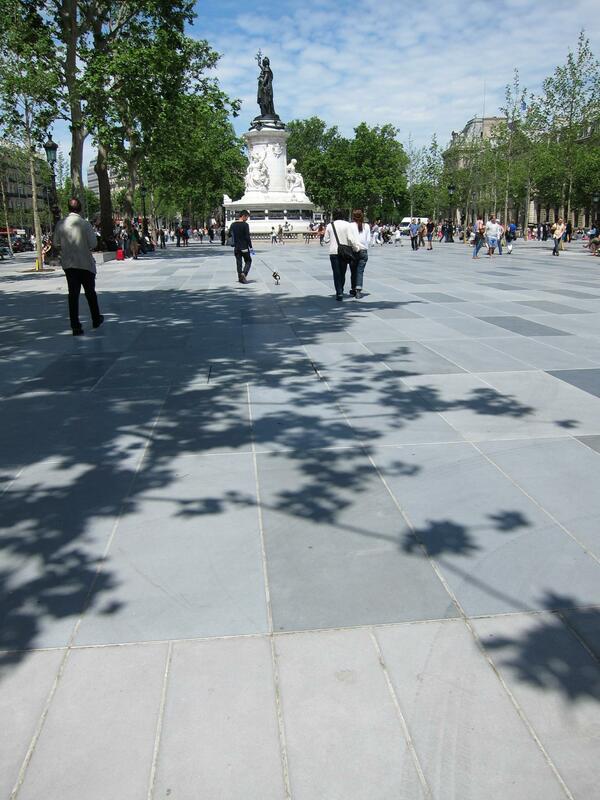 I stopped near a charming little square called the place de l’Estrapade, which I don’t recall from prior trips. 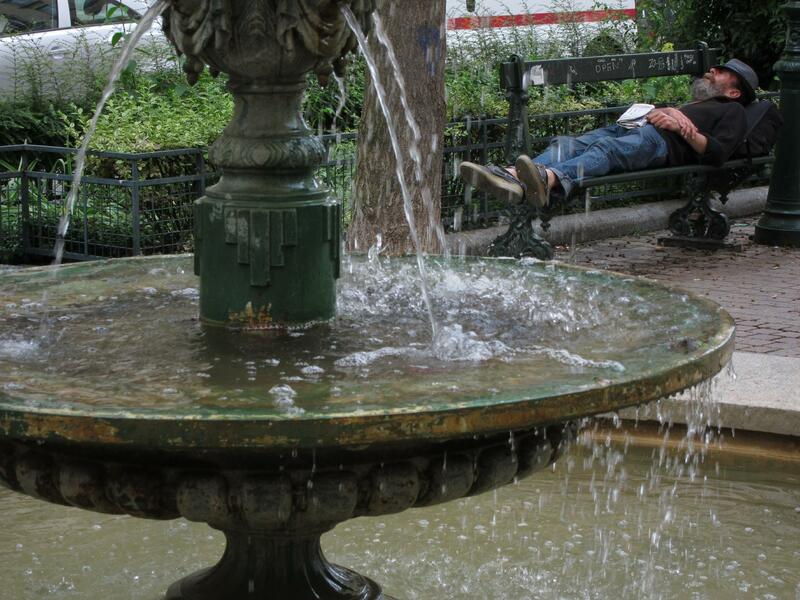 An afternoon snooze at the Place de l’Estrapade. As I was eating my baguette sandwich from the adjacent boulangerie I read up on the history of the area. 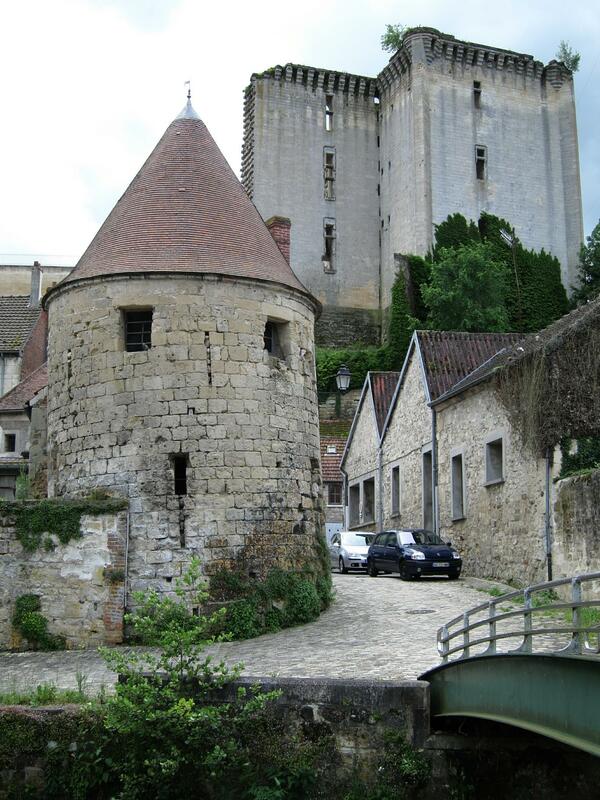 Rue l’Estrapade ran along the 12th century city wall of Philippe Auguste, like rue Tiquetonne in my own quartier: I seem irresistibly drawn to areas still inflected by the medieval street patterns. But I was bemused to discover that this peaceful place was where many protestants had been tortured to death during the wars of religion, by hanging them with their dislocated arms behind their backs and weights on their feet. Much though I love Paris I try to keep in mind its long and grisly history of exploitation and brutality. Resolutely secular though I am, I do enjoy elegant church architecture, such as L’église Saint-Étienne-du-Mont, adjacent to the Panthéon. Then I grabbed yet another Vélib’ and rode home. Sadly, my fitbit has no way of logging bike rides, so it registered a mere 6 miles of walking for the day. Both Jared R. and I had encouraged Jared W. to go to Le musée des Arts et Métiers just a few blocks from my apartment. We had both enjoyed it and we thought that Jared W., as a mathematician, would as well. The museum left Jared W. cold, however, because his interest is in the ideas underlying scientific instruments and mechanical devices, not in the objects themselves. The exhibit captions provided only limited information about underlying principles, and what there was often used unfamiliar vocabulary. I still recommend the museum for anyone who enjoys the beauty of functional objects, but mathematicians beware! That evening Jared and I went to dinner at Lisa and Ali’s place, and I finally met “Lisa’s Geoff,” so called to distinguish him from “my Jeff” — newly-tenured Professor Jeff Redding. Lisa — who appeared to have grown markedly over just the past two weeks — wisely decided to order in, but the meal was as delicious and convivial as if she had slaved over it all afternoon. 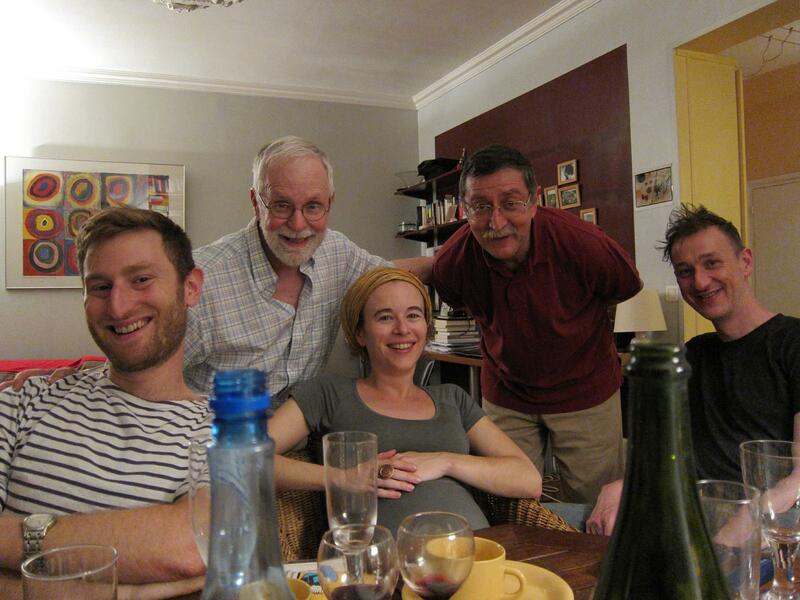 As the only non-academic I struggled manfully to keep up with the sophisticated conversation! To get us all into a photo I balanced my camera on an empty wine bottle — one of several to choose from. In retrospect this was uncharacteristically reckless, especially with Lisa’s Devil Cat on the prowl, but my camera survived and we all got in. Jared, Bob, Lisa, Ali and Geoff at the end of a lovely meal chez Lisa and Ali. After dinner Geoff introduced Jared and me to a cozy gay bar just down the street from my apartment. I had noticed last year that Bar le Bonne Nouvelle sometimes seemed to attract a crowd of interesting-looking men, but it wasn’t in the guidebooks because it had only opened recently. It was friendly, moderately busy and open to the street. At the end of the evening the owner — also a “Bob” — bid us a warm French au revoir. 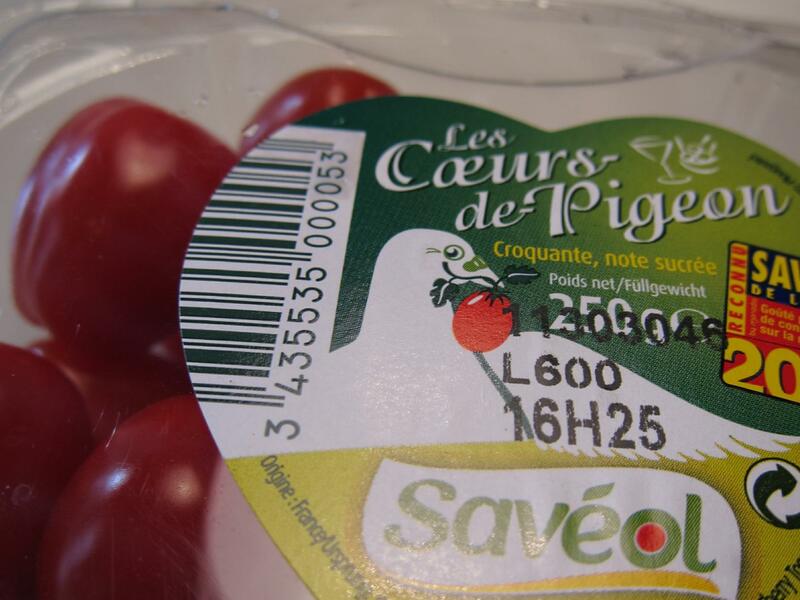 Mot du jour: « coeurs de pigeon ». Literally, “pigeon hearts.” Delicious! 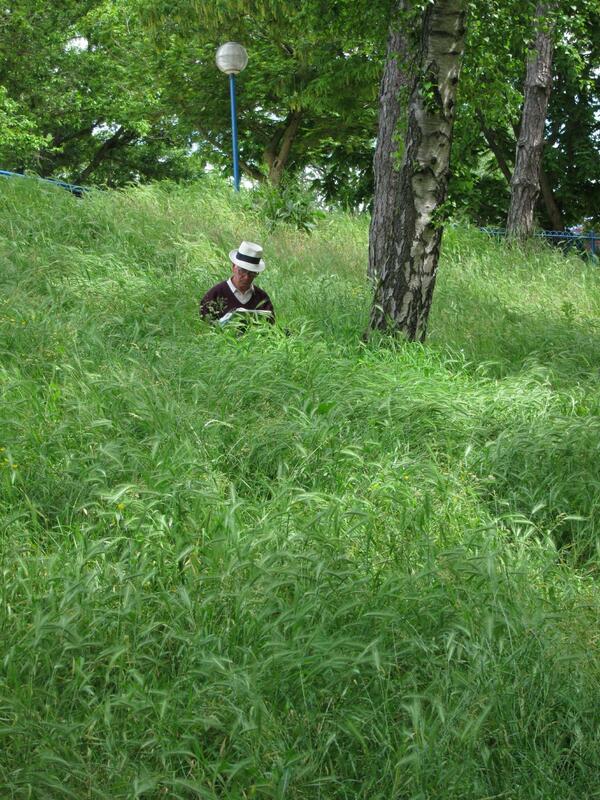 Mike overslept a bit but arrived by early afternoon. I suggested a beer before lunch, but when I opened the refrigerator I noticed a tempting bottle of rosé, which of course, once opened, had to be finished. A few pleasant hours later we set out to forage for lunch. The kitchen was closed in my usual haunts so we ended up at Le Marie Stuart, a restaurant on rue Montorgueil that I had walked past literally a hundred times but had never eaten at. It had a youth-oriented menu, and wasn’t cheap, but our salads were quite palatable. Mike will be moving to Nairobi in the fall but I hope to catch up with him and his boyfriend in Cambridge the latter part of September. I wished Mike bon voyage and headed back home to await my next house guest, Jared. This year’s Jared — Jared W. — should not be confused with last September’s house guest — Jared R — even though they were boyfriends at the time. Jared W. is a math professor at Boston University. While we are friends through various social connections we have particularly bonded on a series of day hikes in New Hampshire’s White Mountains. Jared W. was unable to come with Jared R. last year, but one nice feature of renting in June is that academics — and students — are often free to visit then. Jared W. is now in another relationship, but his new partner was unable to join him here. Jared arrived on schedule via RER train. 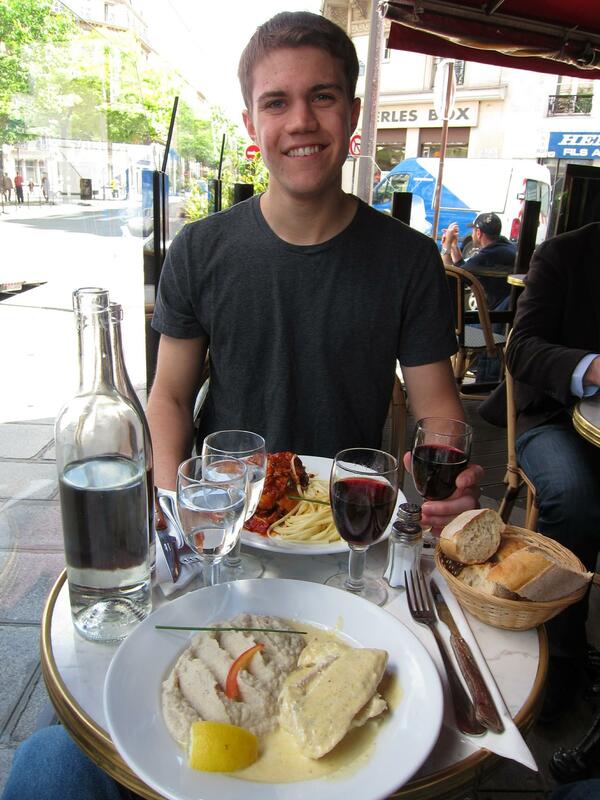 After he settled in we headed off to Gare de l’Est to meet my French friend Alexis for dinner. 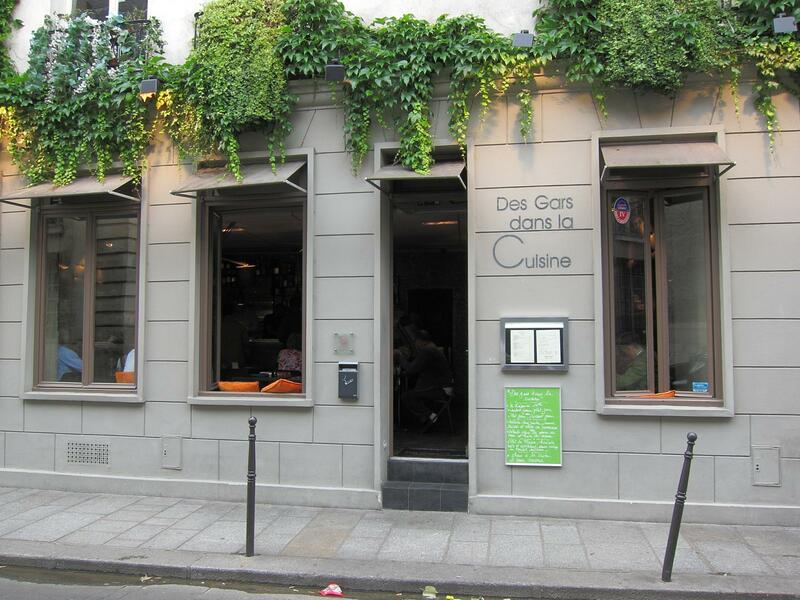 We ate at Marcel, a stylish restaurant on the Canal Saint-Martin serving Indian food. The atmosphere was pleasant and the food was really good. The on-line critiques that you can get comparable Indian food much cheaper elsewhere seem to me wide of the mark. After making considerable progress over dinner towards solving the world’s problems (including those created by human nature itself) Alexis suggested we visit the nearby African-themed Ghetto Museum. This is quite an extraordinary place, including several contemporary art installations. I snapped Alexis and Jared at a replica African photography studio. Something about the environment — possibly the tropical level of heat and humidity — made us thirsty, but fortunately the museum has a well-stocked bar. Several secousses later we staggered back along the Grands Boulevards to our respective homes. Mot du jour: « bobo », short for « bourgeois-bohème ». Basically, a well-off left liberal. Alexis doesn’t identify with the term, because he considers himself 80% bourgeois, 15% Breton and 5% bohemian. Jared and I felt fortunate that Alexis still has a broad enough bohemian streak to introduce us to the Ghetto Museum. On Sunday morning I grabbed a Vélib bike and had a look at the opening of the Place de la Républic, after a year and a half of renovations. Great “place” for a massive demonstration! 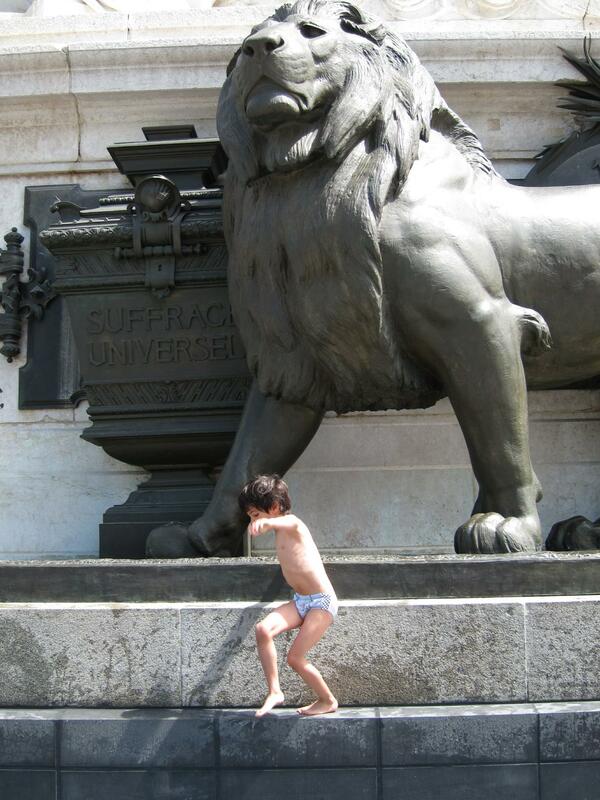 The most innovative feature of the renovation was circling the grandiose monument with a wading fountain. 2016 Update: Place de la République is very, very different after the Charlie Hebdo murders and the Nuit Debout demonstrations. This proved to be a brief moment of beauty and tranquility in a troubled world. I decided then to explore the brand-new 3b tram line that runs from Porte de la Chappelle to Porte de Vincennes. Any line with stops for both Rosa Parks and Ella Fitzgerald is worth a look! I finally got to see the Canal Saint-Denis, a wide canal branching off the Canal d’Ourcq, with quais similar to those along the Seine. It seems like an under-developed resource, but not something you have to rush over to see. More interesting was the Parc de la Butte du Chapeau Rouge (“Park of the Hill of the Red Hat”) near Porte de Pantin, which I have noticed on the map for years but never quite gotten up to. I entered with some trepidation: Would it be run-down, even dangerous? Would I be menaced by homeless people and/or desperate drug addicts? Um, no and no. Sunday afternoon with a magazine in the Parc de la Butte du Chapeau Rouge. 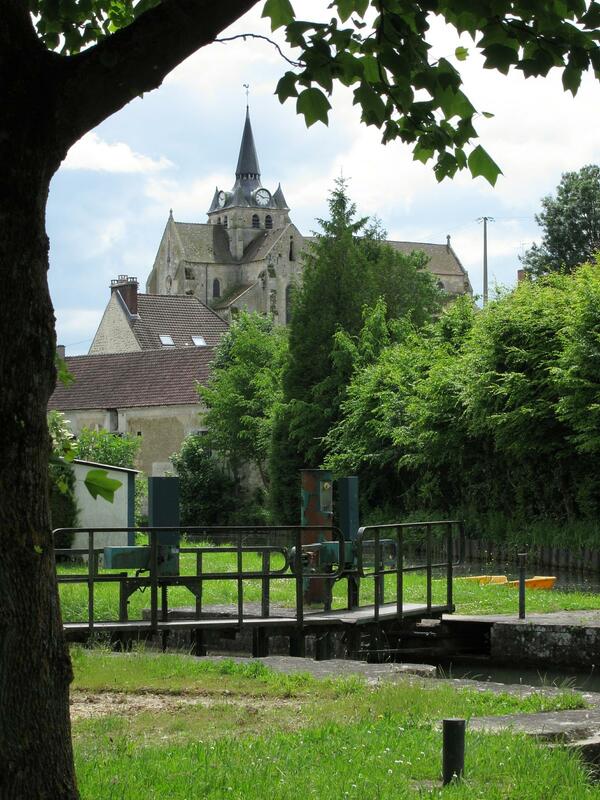 It was a lovely neighborhood place, filled with picnicking families. 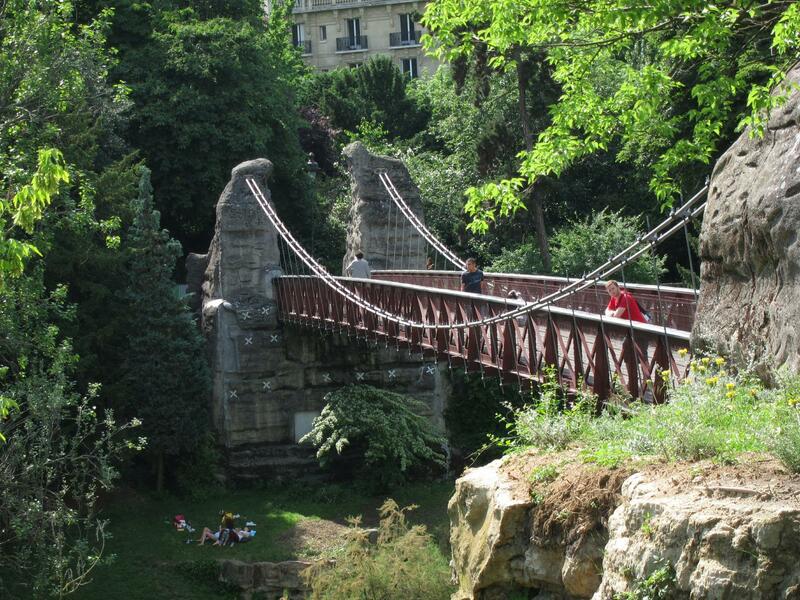 I then strolled along rue de Mouzaïa towards Parc des Buttes Chaumont. I couldn’t help noticing a steep little alleyway running up to the left called Villa Félix Faure. 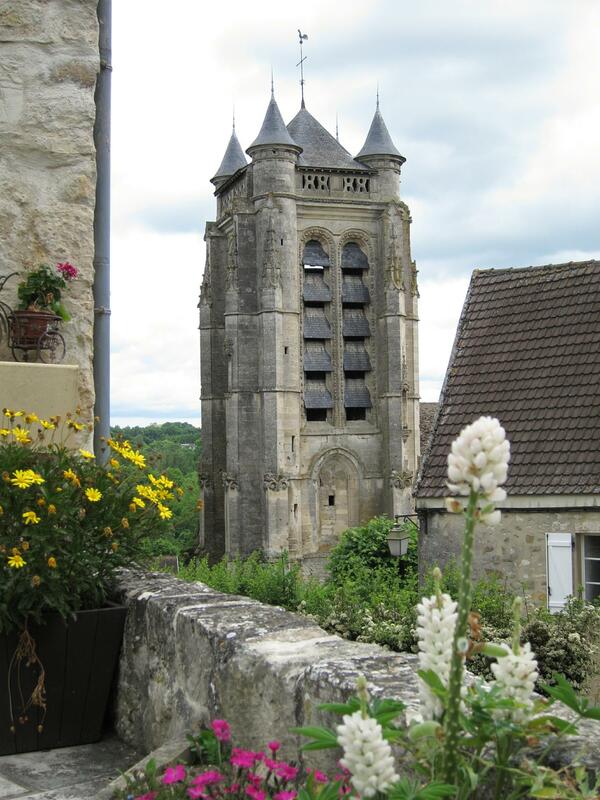 As a true flâneur I strolled up it and was delighted by the cute single-family houses, trees and especially flowers. Continuing towards Buttes Chaumont along rue de Bellevue I encountered another Villa running down that was even prettier. A nice guy at the bottom, chatting with a neighbor, smiled and told me to keep going left and right — there were seven Villas in a row, and I now see on the map that there are even more down the hill. 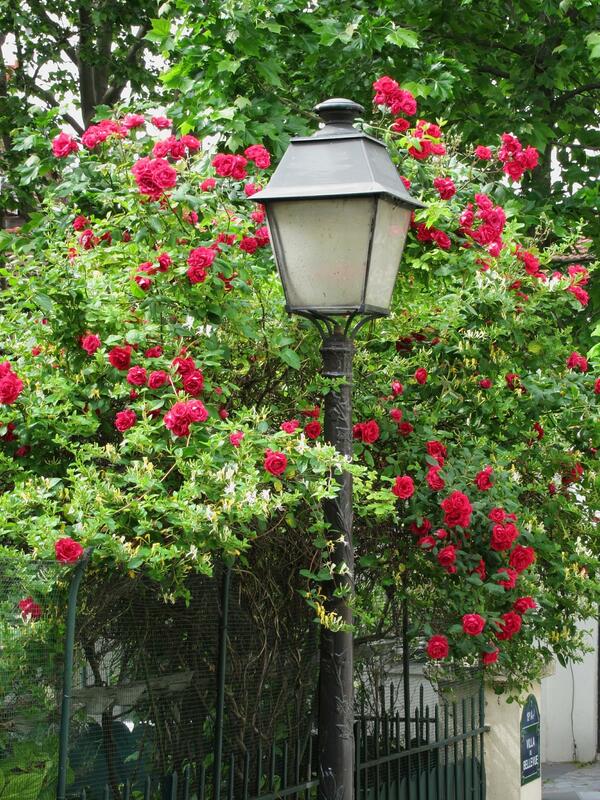 Here’s a photo set of La Mouzaïa – Villas of the 19th Arrondissement. Whenever I get back there I’ll add a few more since I saw less than half of the villas in the area. 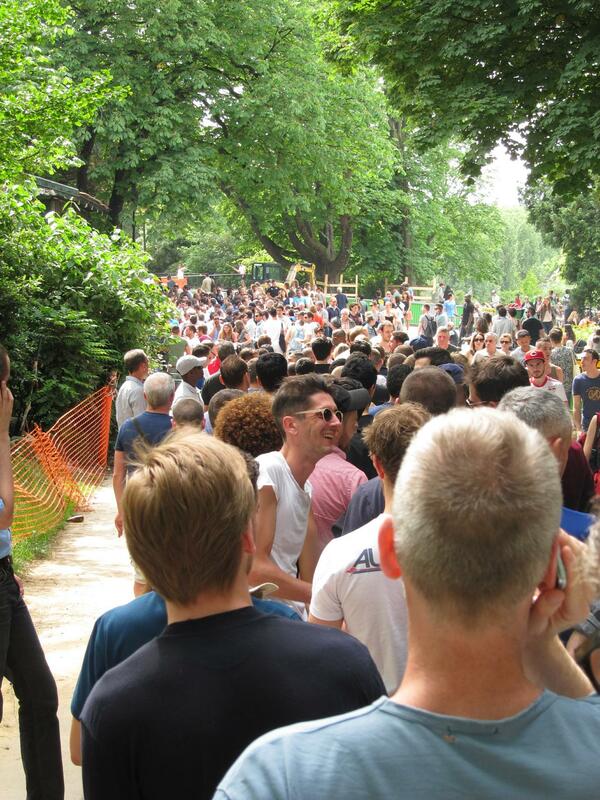 The line to get into Rosa Bonheur, at 4:30 on the first truly lovely Sunday afternoon. Get there early! After waiting 45 minutes and seeing the line move only a few feet I abandoned ship and headed home to get ready for the Harvard LGBT alumni dinner that evening, on David Johnson’s fabulous terrace. 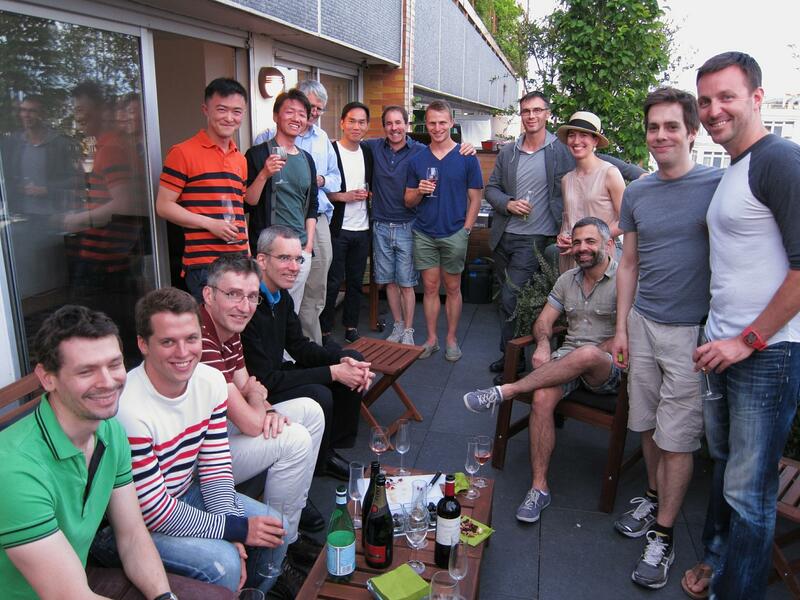 It was a gorgeous evening and it was a great bunch of guys — plus, for the first time ever at a Paris chapter event, a woman! 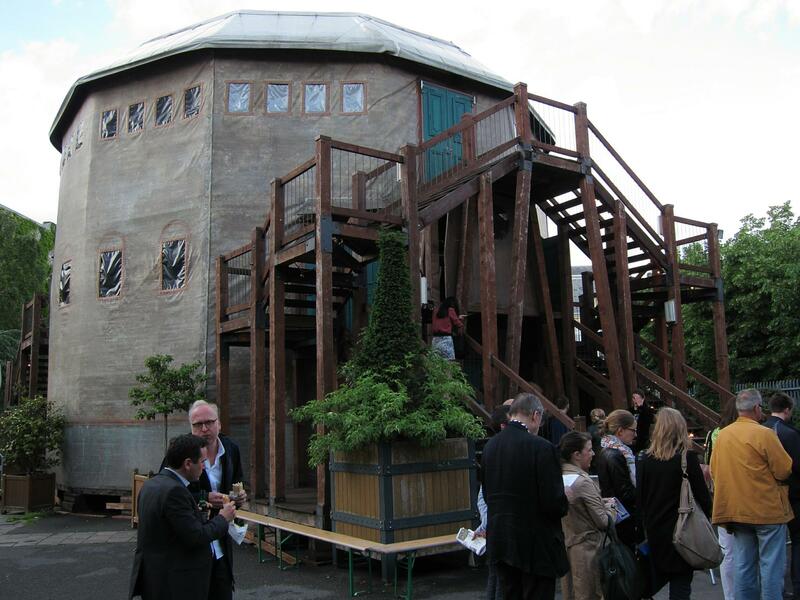 This Romeo and Juliet is performed in a wooden theater modeled on the original Globe (though the groundlings have cushioned seats instead of having to stand). I really enjoyed the performance despite the fact that most of the dialogue (as expected) blew past me. My flâneur friend Alex pointed out that it was similar to watching TV with the sound off — your appreciation of the visual experience is heightened when you miss the words. The actors were excellent and in the second row I was just a few feet from them. At one point I even got splashed when Romeo’s friends were playing around in the fountain, before the roughhousing turned deadly. I’m not sure whether it was this production or my greater *ahem* maturity but I found both Romeo and Juliet to be almost annoyingly addled (albeit lovely, playful and preternaturally articulate). I was more strongly affected than in prior performances by the issues of community and the damage caused by the rift between the Montagues and Capulets. Walking home after the performance I was struck by how calm and beautiful the Saint Paul neighborhood is, below rue de Rivoli, in contrast with the raucous gay bar district just a few blocks to the north. On Friday I met up with Alex, the B.C. student whom I had met in the airport, for a walk across some lesser-known parts of the city. 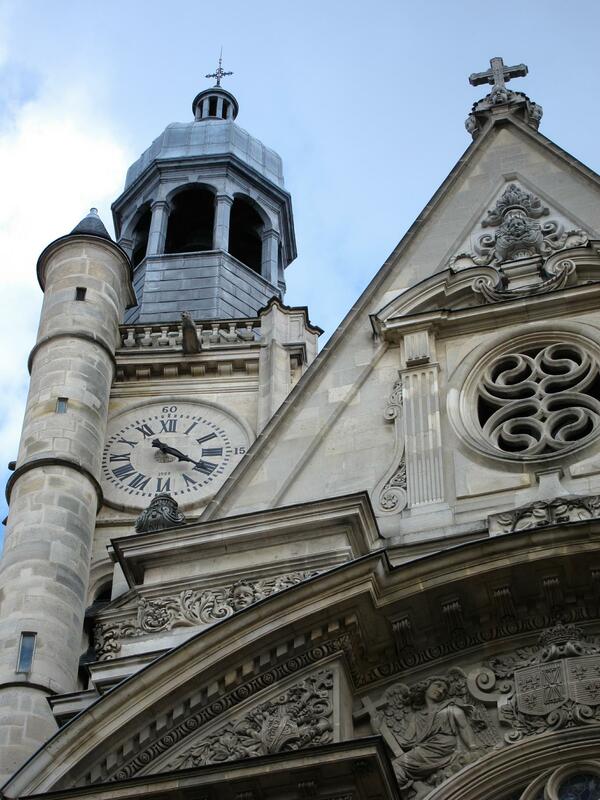 We started with a tour of my beloved Montorgueil neighborhood and lunch at a favorite local place, L’Absinthe Café in the nearby Arts et Métiers quarter. After lunch we took the métro over to Père Lachaise and started to explore. A walk up to Gambetta was interesting enough, as was a look at the charming two-story neighborhood around rue Irénée Blanc. Alex on rue Irénée Blanc. From there, however, we found ourselves in relatively sterile residential areas near the edge of the city. 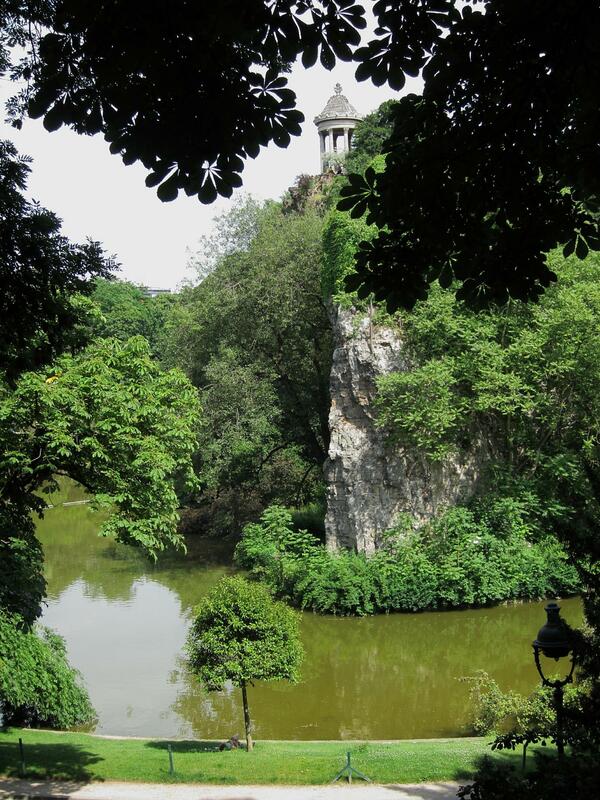 I steered us back towards the Parc des Buttes-Chaumont, which was, as usual, a winner. Alex commented on how romantic the park was; I heartily agreed even though I knew that he was assessing it as a destination for a future date with a young lady. 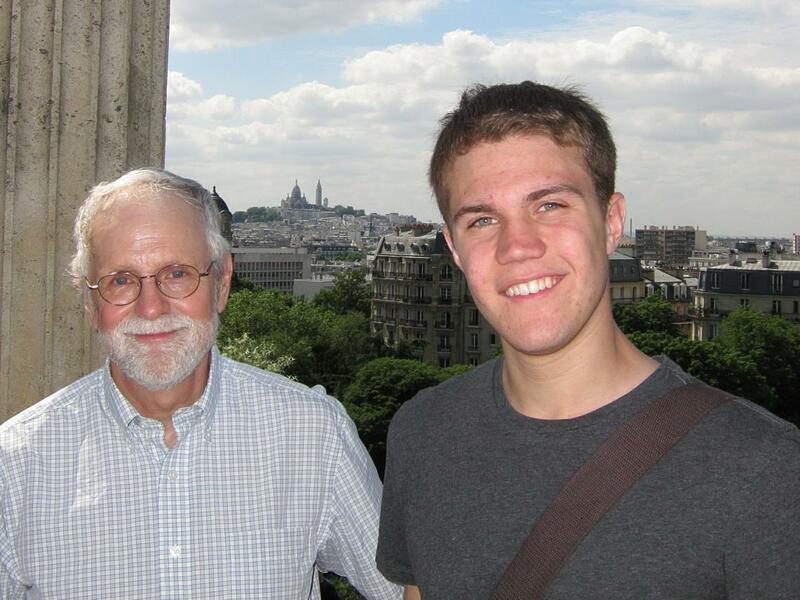 Bob (with hat hair) and Alex, with Sacré Coeur in the background, at the Temple de la Sibylle in the Parc des Buttes-Chaumont. 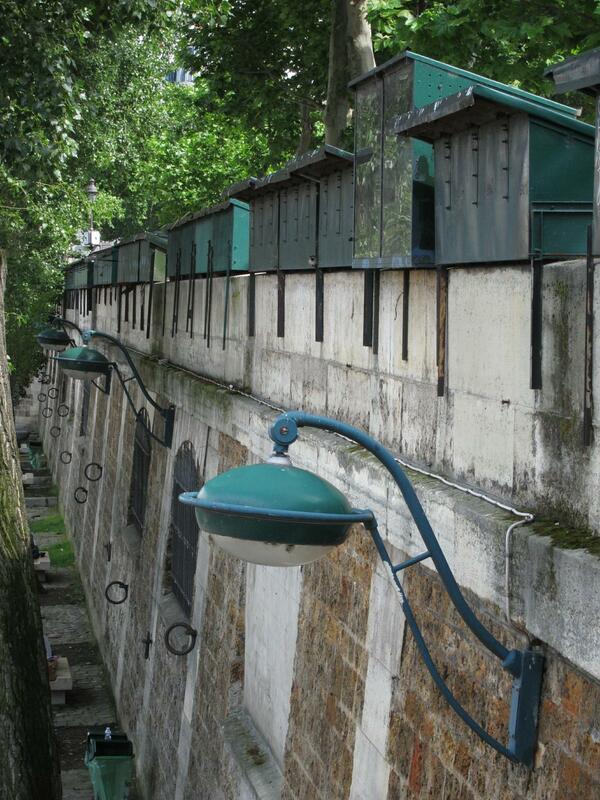 From there we walked down to the Canal Saint-Martin, then along the Canal and through some of the cool adjacent areas. Alex jumped on the métro just before six, and I walked home. Not quite a record, but more than 11 miles, so not too shabby either. Mot du jour: jeu de mots. Play on words.